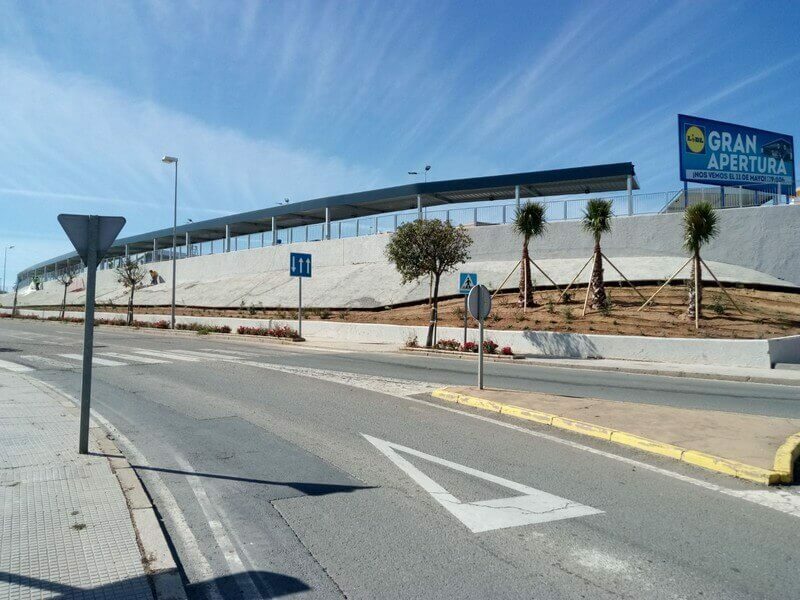 Our company is carrying out two new projects for pedestrian walkways and parking shade at Barajas airport. 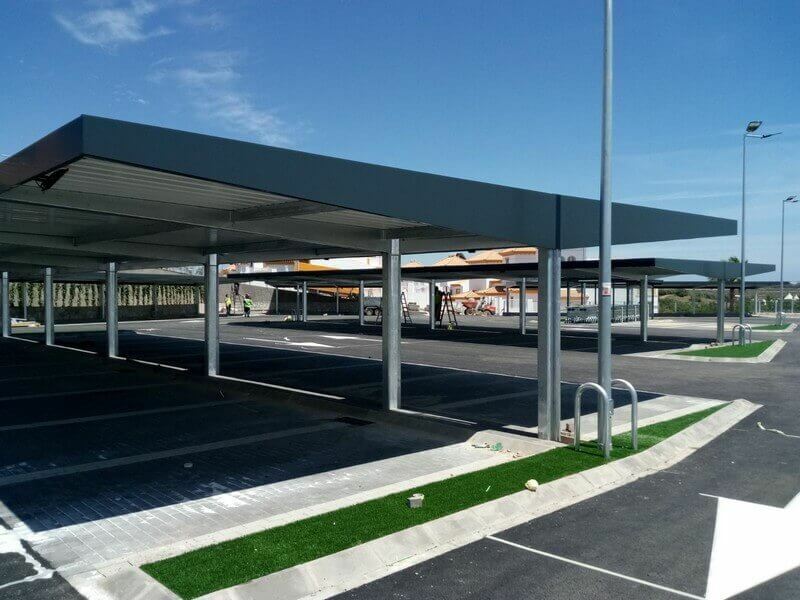 We are assembling 5980 m2 of parking shade and canopies and 399 m2 of pedestrian walkway for Rentacar. 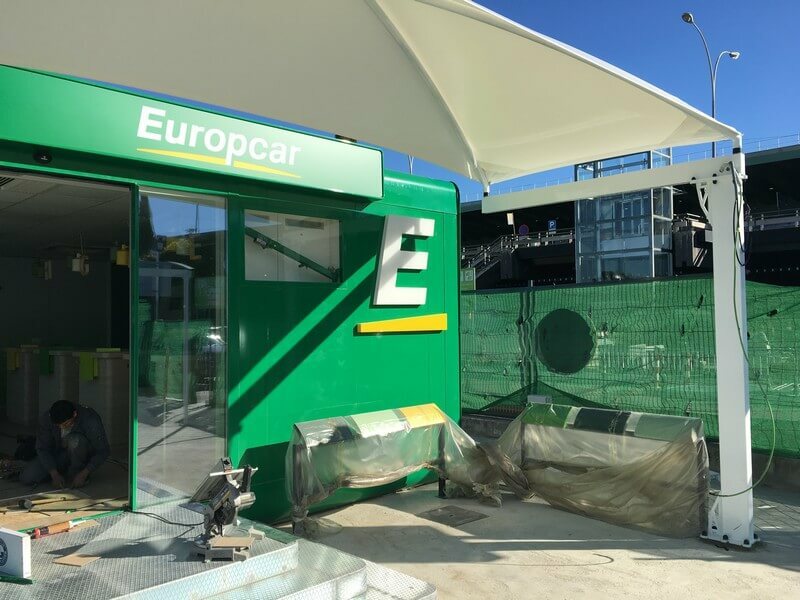 We have also installed a textile parking shade for Europcar, which will provide a parking shade area while customers wait to receive their rented vehicle. 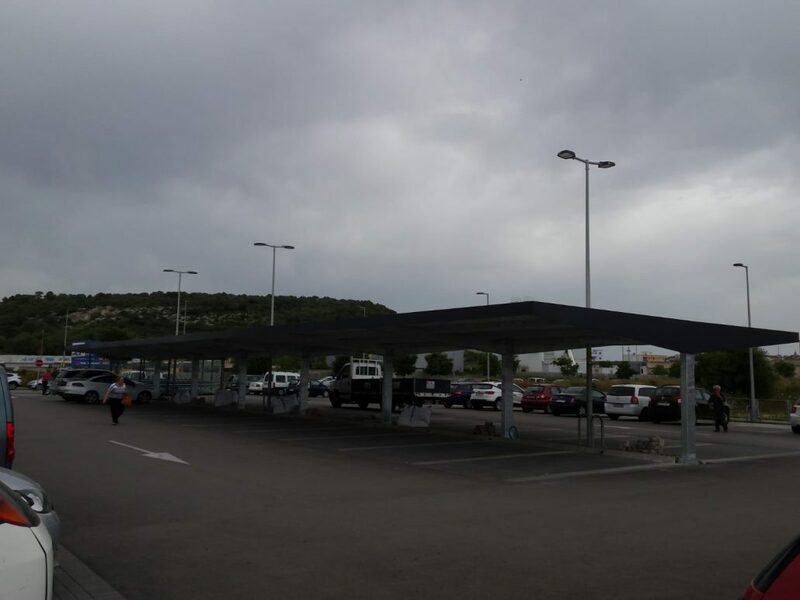 The company required the installation of a textile parking shade with a special height to shelter its customers. 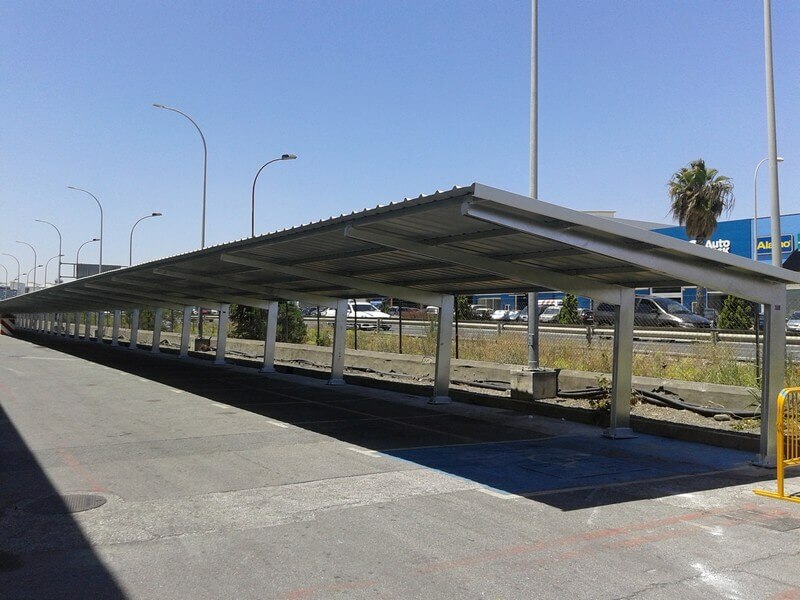 Rentacar needed the installation of 5980 m2 of parking canopies and 399 m2 of pedestrian walkways. The guarantee a perfect aesthetic harmony with security and materials quality. They are modular structures that can adapt to the spaces geometrics. 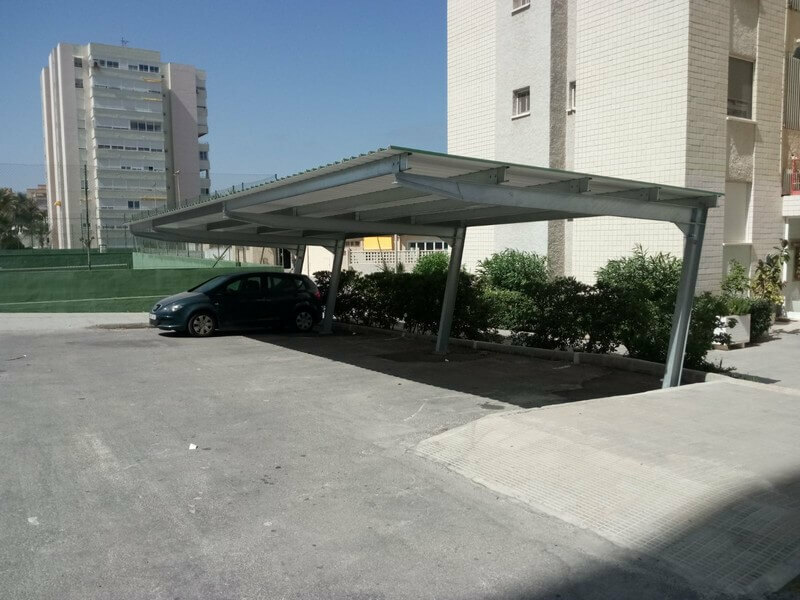 Its versatility goes further the usability as parking canopies for cars, as they can also be used in terraces and gardens for shadow areas. With a square tube pillar made with sheets of folded steel. 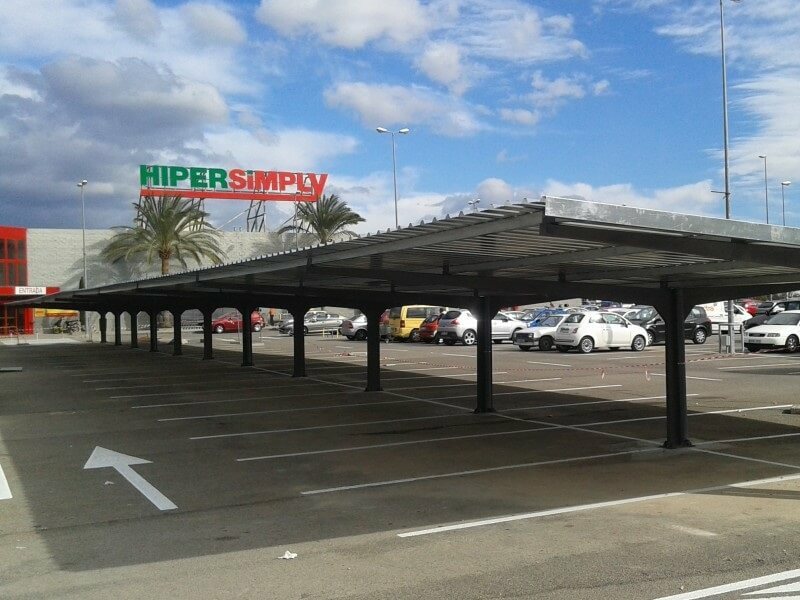 It is an aesthetic parking canopy, low cost available in simple or double version. Galvanised or pre-lacquered cover on the colour chosen by the customer. Maximum safety and quality of the materials used. Maximum strength of the structure capable of withstanding overloading of wind and snow. There are different versions depending on the type of girders used. Galvanised or pre-lacquered roof in the colour demanded by the customer. Special design with metal trusses diamond-shaped roof. Hot galvanized structure upon request. Different simple or double versions. Galvanized or pre-lacquered roof, colour upon customer’s request. We substitute the cover galvanised panel sheet by an isolating sandwich panel to offer a better thermal and acoustic isolation. Solution available in all the parking canopy models. Different options for the sandwich panel in polyurethane: colours, thickness, flat or roof tile shape, etc. 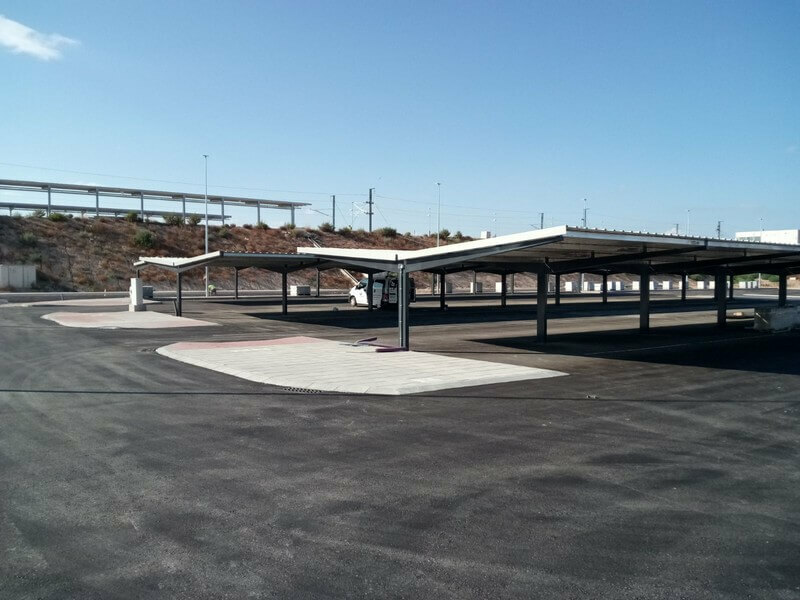 As a company specialized in manufacturing of parking canopies, we have developed several models of solar carport structures in order to bear the load of photovoltaic panels on the roof. At Europa Prefabri we manufacture our models as well as the customers’ design. We also develop turnkey solutions that include the supply and assembly of the photovoltaic facilities. We advice our customers in order to find the energy and structural solution that better adapts to the customer’s project. It is also possible to add charging stations for electric cars. 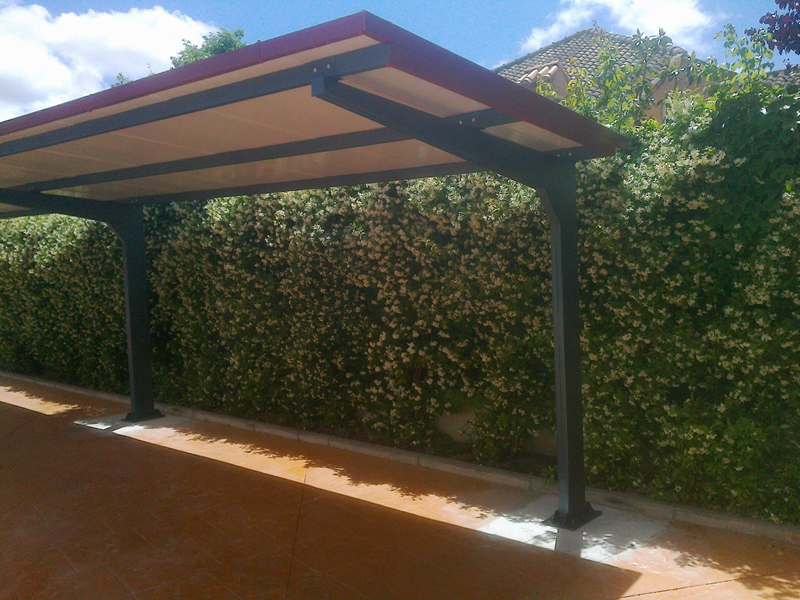 Special design of the cantilever carport with a curved shape and folded-steel frames. Galvanized or pre-lacquered roof with colour chosen by the customer. Hot galvanized structures upon customer’s request. Possibility of adapting the model depending on the customers’ needs. 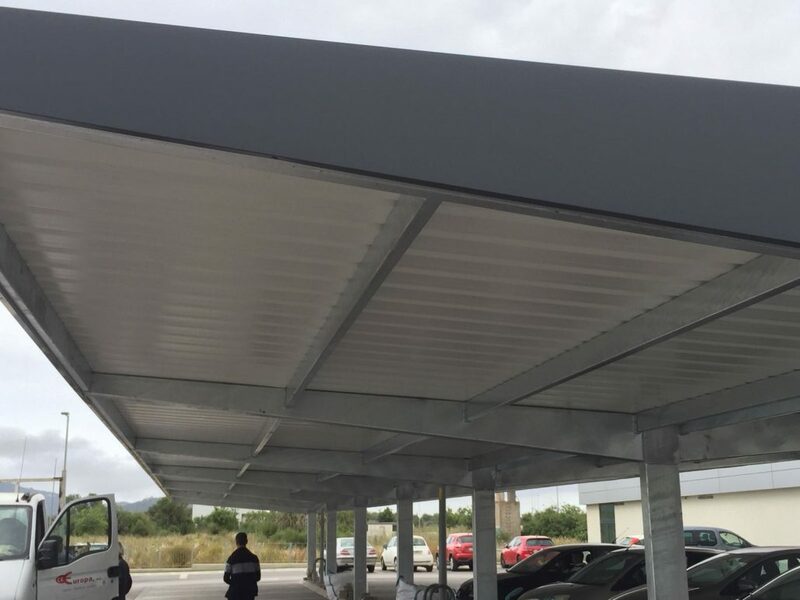 Parking canopy made by metallic lattice with welded profiles. Different versions, simple or double. Galvanized and pre-lacquered roof, colour upon customer’s request. Hot galvanized structures upon request. Maximum security and material quality. Possibility of adapting the models depending on the customers’ needs. 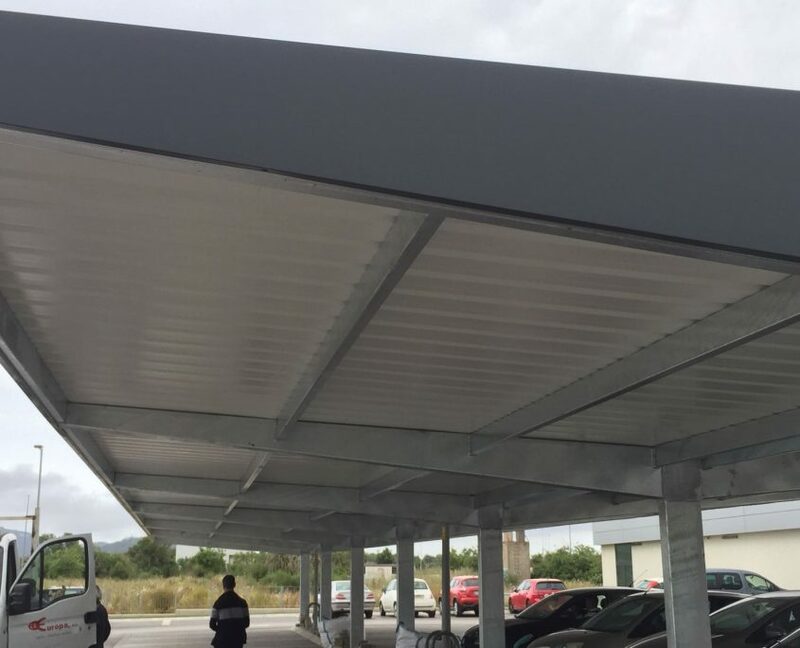 Special parking canopy with an original design made with hot-rolled steel beams with metallic straps. Possibility of a pedestrian hallway with polycarbonate roof in the double version. Galvanized or pre-lacquered roof, colour chosen by the customer. Hot galvanized structures upon customers’ request. Maximum security and materials quality. Possibility of adapting the model depending on customers’ needs. 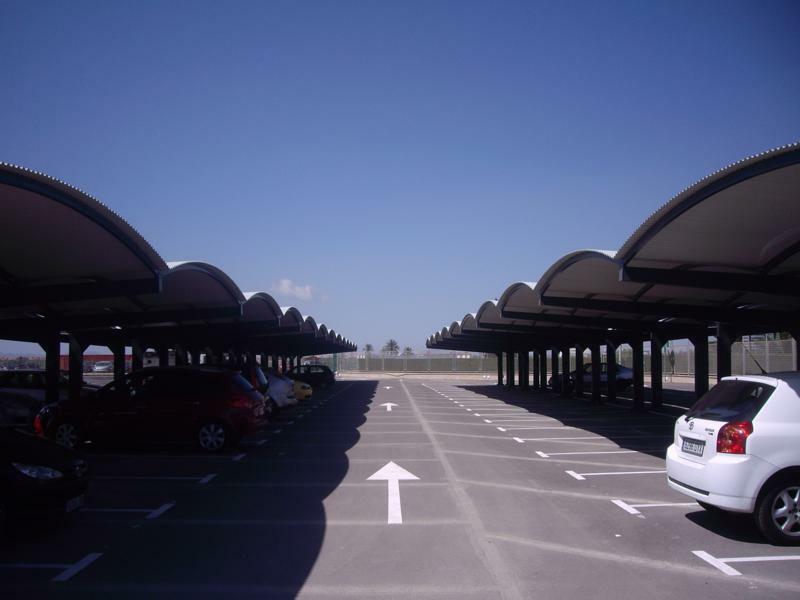 We are specialized in the manufacture and assembly of parking canopies. Our company has more than 30 years of experience in this sector. We do all the necessary works for the assembling of the parking in the location demanded by the customer, so he only needs to make an order. 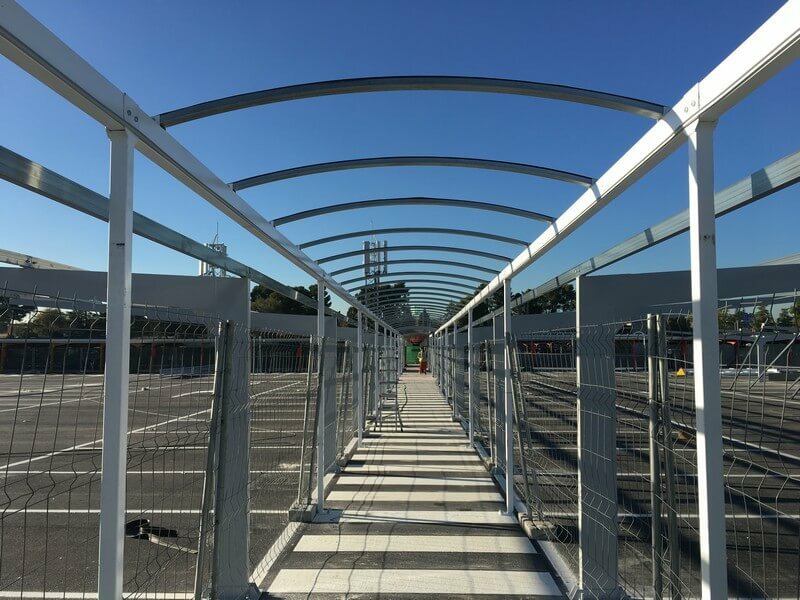 Europa Prefabri offers a full service that includes from supply and assembly of guard cabins or automatic barriers to road signalling or civil works: from small private parking canopies to neighbourhood parking canopies to big projects in airports, stations, big companies and malls. We also develop services like maintenance, substitution and preparation of old parking structures or replacement of spare-parts. Estructuras Tubulares Europa is a direct supplier. The materials we offer as well as the people that work with them are fully integrated in our company, so there is no intermediation in the established monetary consideration. This basis allows us to provide the best service with a competitive price to our customers. 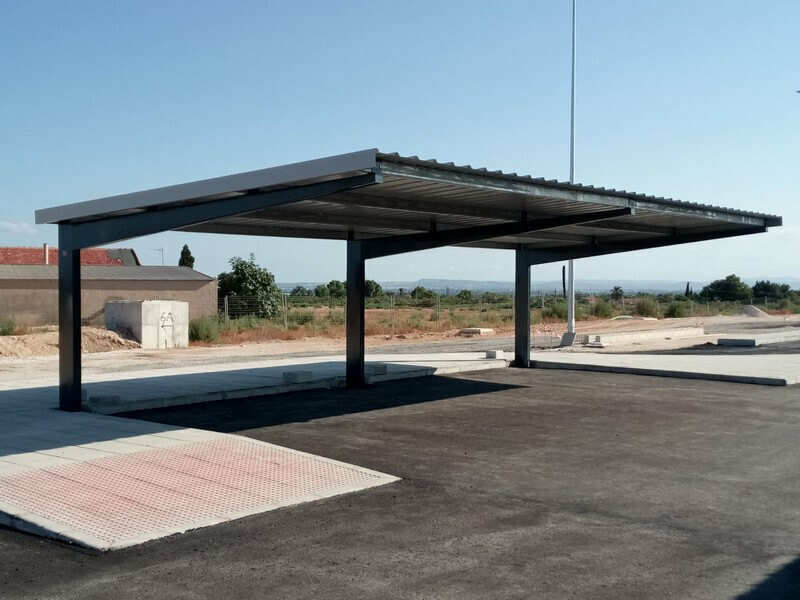 Europa Prefabri carries out carport projects for large surfaces (supermarkets, airports, train stations, factories, shopping malls, public institutions) and private parking canopies (homeowner’s community, chalets…). 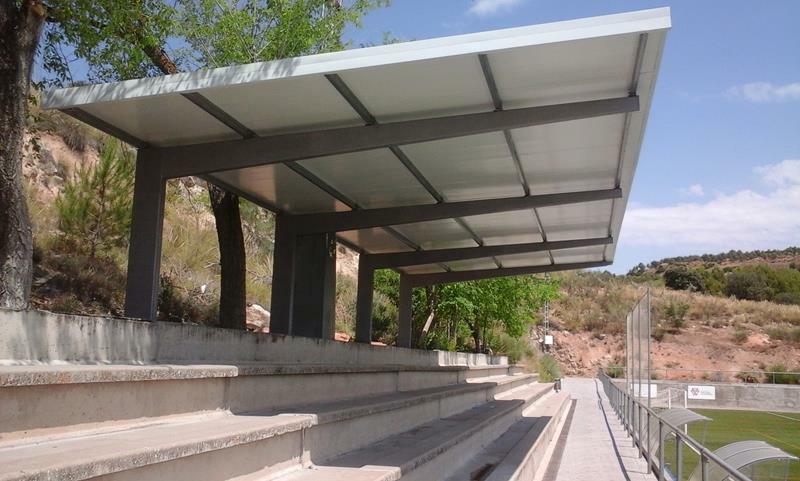 We have also carried out projects of special canopies for golf courses and for covering the stands of football stadiums. Over 30 years we have carried out large projects. 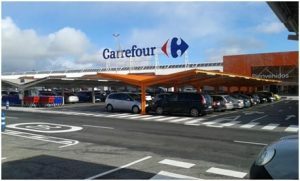 We have installed parking canopies for airports (Madrid, Malaga, San Javier); for train and tram stations (Elche railway station, tram depots in Ouargla, Algeria); for large supermarkets, such as the projects carried out for Lidl, E.Lecrec, Simply, Carrefour… and for public institutions, such as those that we carried out for the Navarra Police Force, the Spanish Navy or the Carlos III Institute. 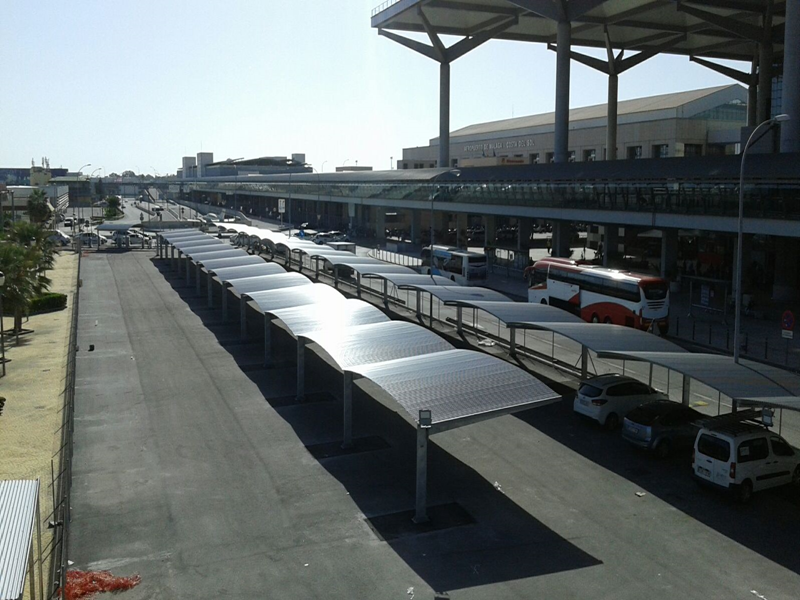 Design, transportation and assembly of parking canopies for AENA at Málaga’s Airport, where we installed 90 cantilever carports model “OLA”, with a wave shaped roof. The distribution was of two simple modules, the first for 59 spaces and the second for 31 spaces. 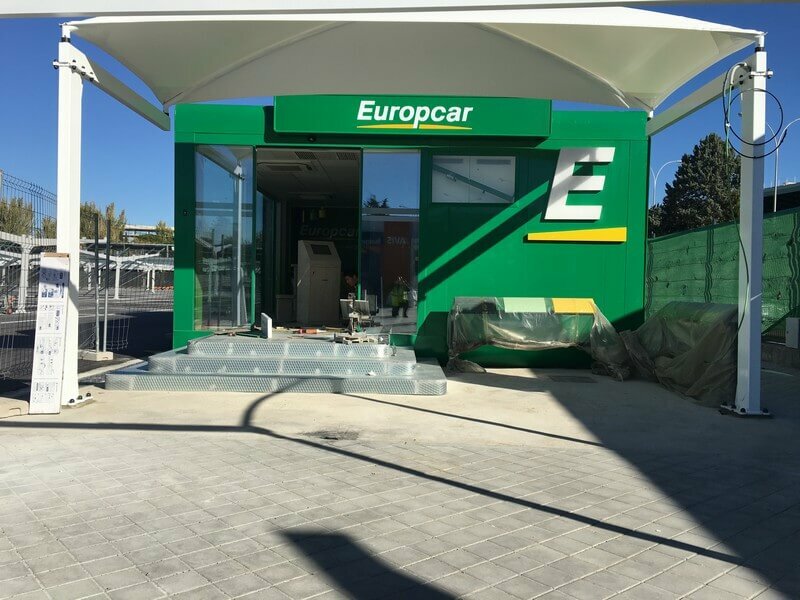 We also assembled three special parking canopies to cover the entrance and exit barriers of the parking, as well as another special canopy to cover the ATM. 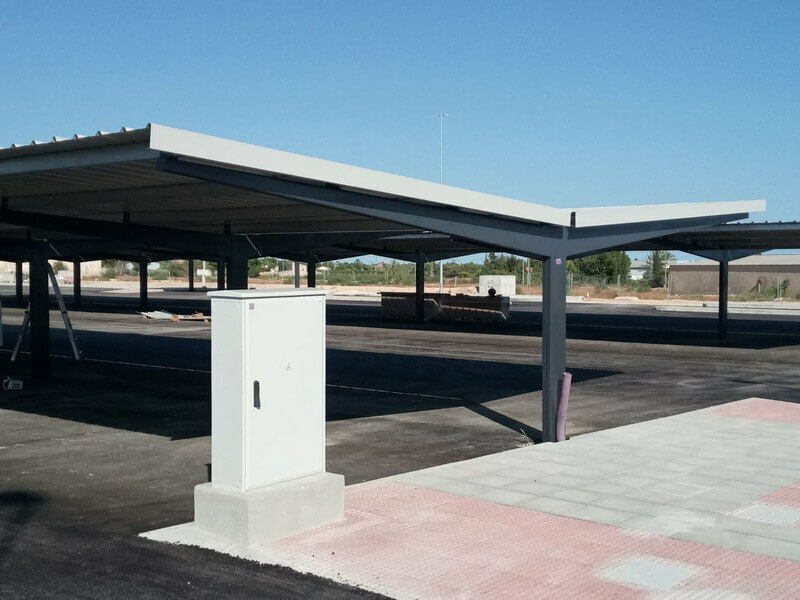 We carried out the design and installation of 1.200 parking canopies for San Javier Airport at Murcia. In this case, our client chose the “OLA” model. 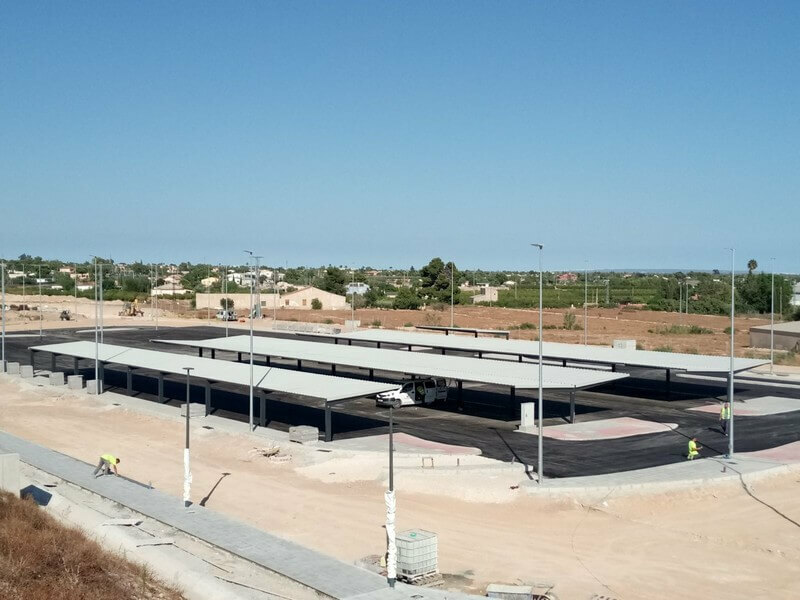 Design, transportation and assembly of parking canopies for Ouargla’s train station parking, in Algeria. We covered 161 parking spaces in 8 groups for standard cars, 12 parking spaces for special cars for people with reduced mobility and 20 spaces for motorcycles. 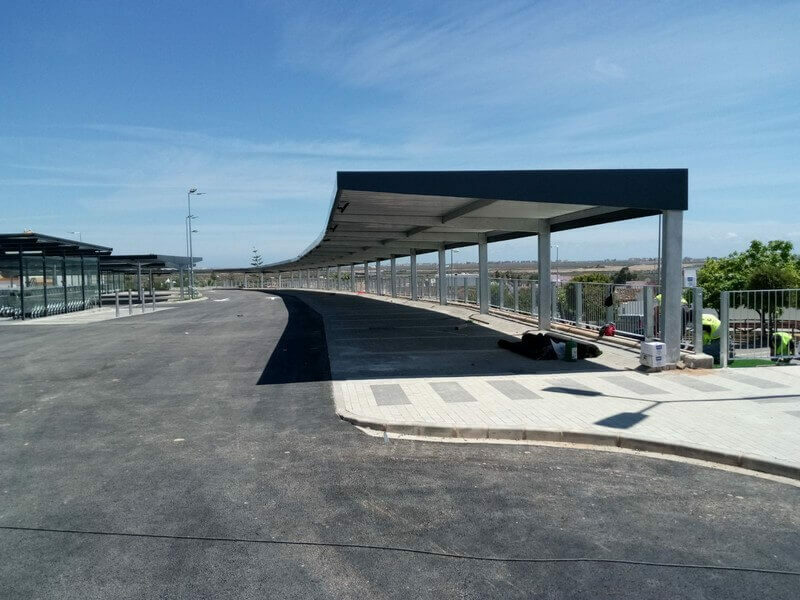 Fabrication, design and installation of parking canopies for the new AVE railway station at Elche, Alicante. On this occasion, we carried out the installation of 96 canopies, being 90 of them standard canopies, 14 single and 76 double. Besides, there are 6 spaces with special dimensions for people with reduced mobility. 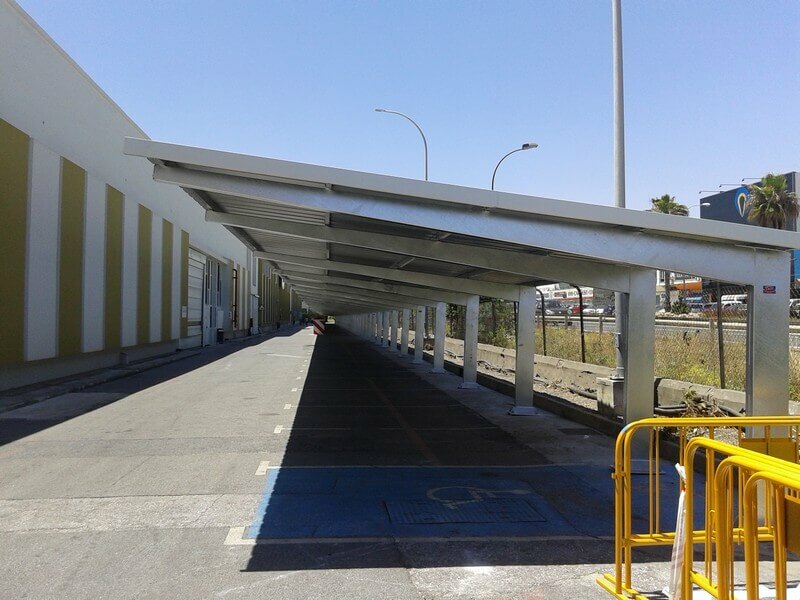 We have developed the manufacturing, design and assembly of a cantilever carport project for San Miguel’s beer factory at Málaga, which has a surface of 60 000 m2 and produces 2,5 millions of hectoliters per year. Hot-rolled galvanized brackets (column and arm), designed to better resist the meteorological and environmental conditions of the location. On this occasion, our client chose the Europa Model type A. Brackets placed using chemical dowels. Spots of 5×2.3m depending on customer’s demand. 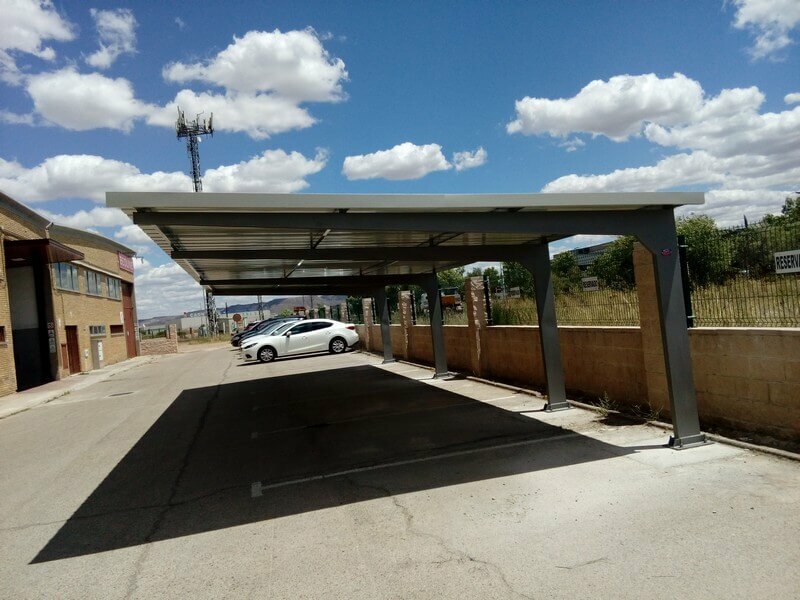 We have carried out the design, fabrication, transportation and installation of a new group of parking canopies for Metalogenia at Huesca. In this case, we installed our IPE model. 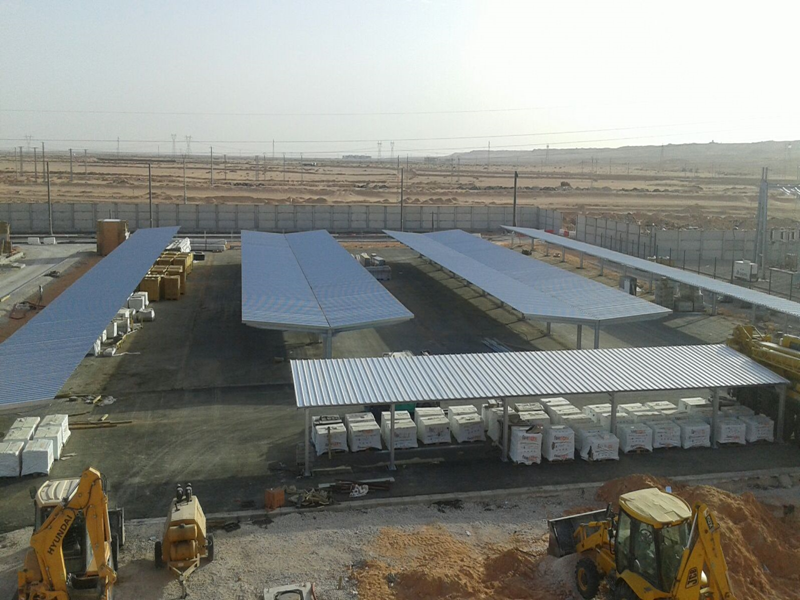 We installed 102 carports (single and double) distributed in 4 groups. Cover made with a trapezoidal sheet of 5 meters pre-lacquered and painted in grey. 34 brackets placed using chemical dowels. Lacquered roof gutter and PVC down pipes. Spots of 5×2.50m according to customer’s demand. 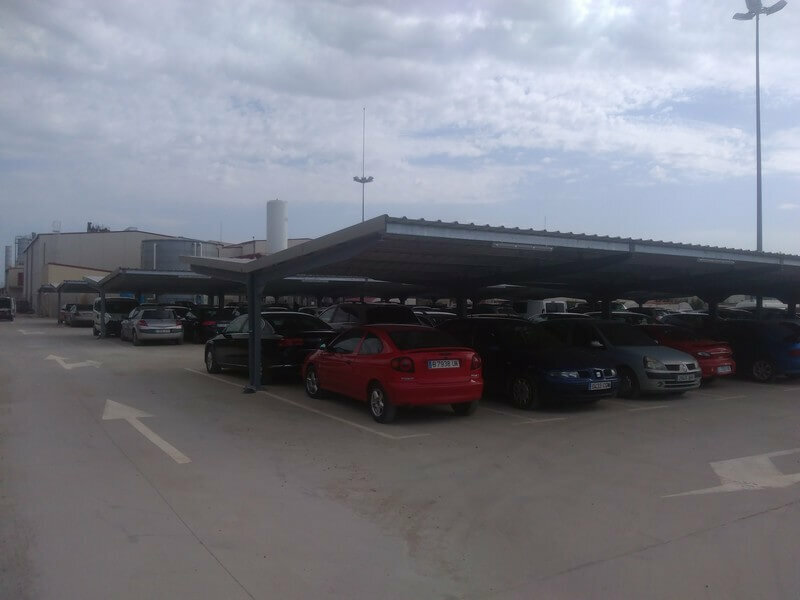 We have developed the manufacturing, design and assembly of 56 parking canopies for Bosch factory at Madrid. To protect cars from climate conditions we have assembled custom parking canopies model Europa type Y for Navarra’s Police Force. 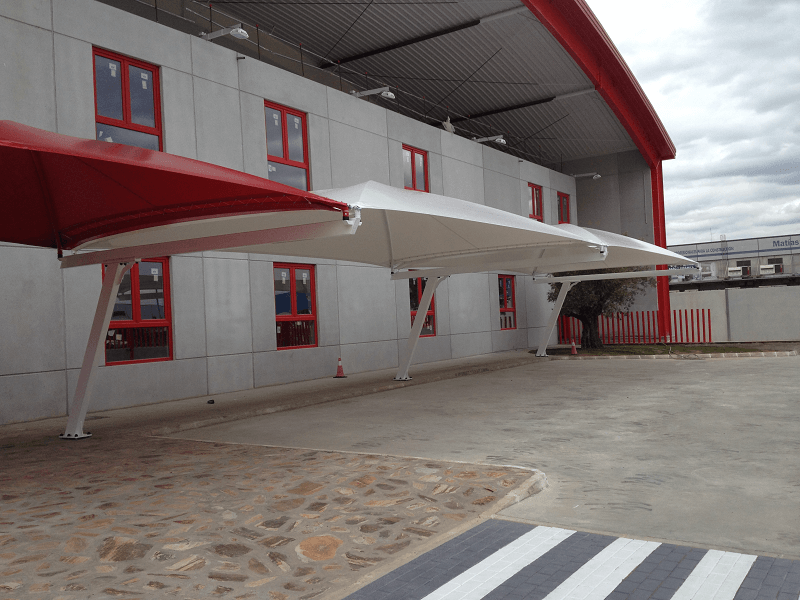 We installed the canopies, which we had previously manufactured them in our facilities, in 3 days. First quality cold forming sheet with a fold for an inside maximum reinforcement, in order to get a metal box beam along the whole porch. Roof made of red lacquered sheet and painted brackets (colors following customers’ requests). Fastening to the porch’s roof through galvanized self-tapping screws with washers. Tube galvanized straps of 80x40x2mm. 40 park spaces distributed in two double groups of 20 spaces each (10+10). 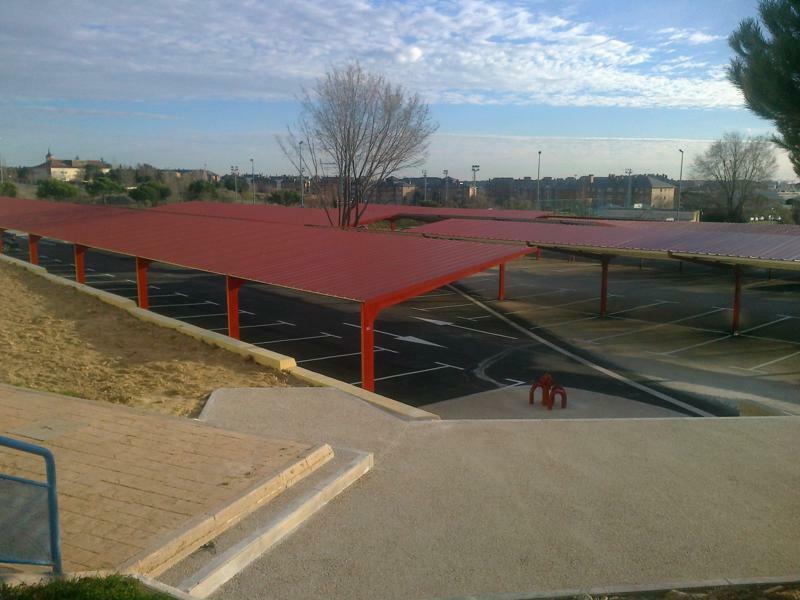 Park space measures: 2.5 x 5 m.
We installed more than 90 parking canopies for the Carlos III Institute at Majadahonda. In this case, we assembled various groups (single and double) of our Europa model, painted in maroon. 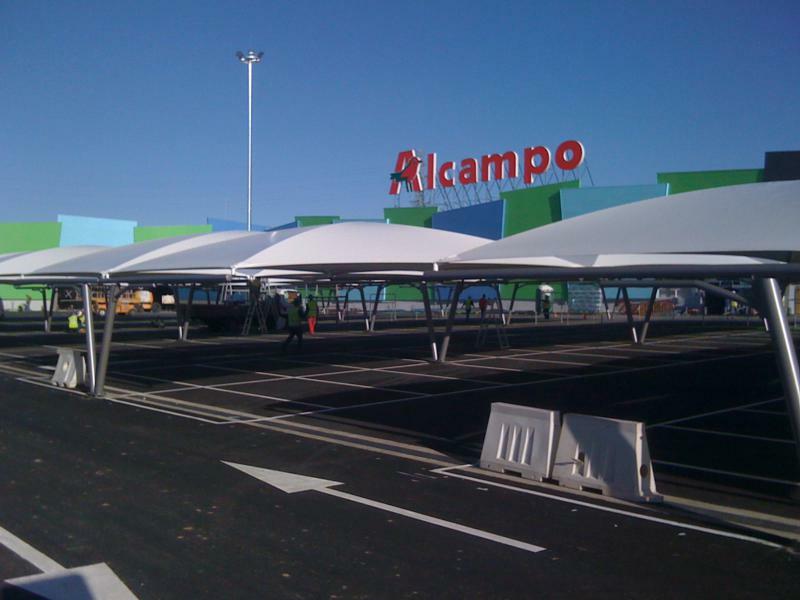 We carried out the fabrication and installation of parking canopies for the Spanish Navy. The brackets chosen were of the B model, with a small back heel that does not hinder to park comfortably, but gives the canopy greater aesthetics. The client chose a stone grey lacquered cover finishing and painted structure with grey oxidized, plus two coats of anti-phosphate and antioxidant primer. 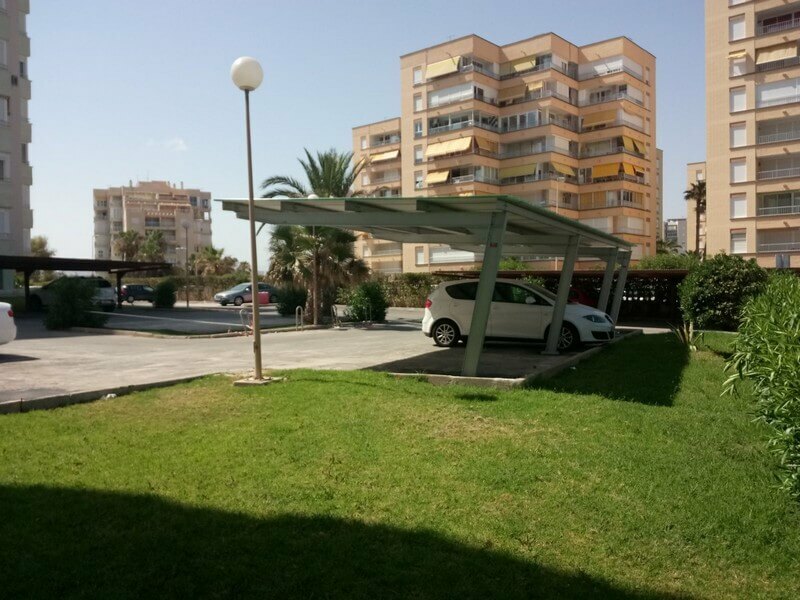 We have developed the fabrication, design and installation of parking canopies for a homeowner’s community in Benidorm. This project is a new expansion, completing that already implemented in May, with a total of 32 single parking spaces divided into two group. In July 2016, we had already installed 96 double parking spaces, divided into two groups, and in 2015, we had assembled 27 parking spots. 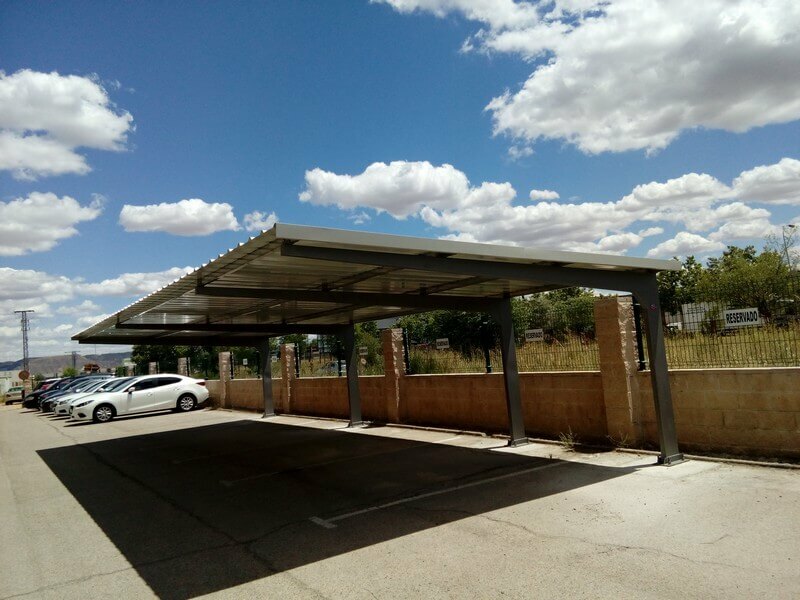 We have manufactured, designed and assembled a project of parking canopies for a homeowner’s community at Alicante. 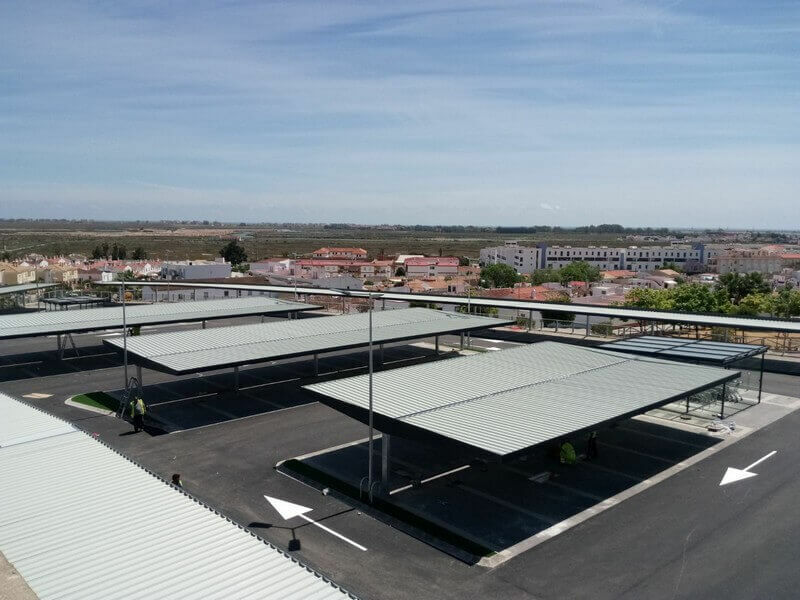 On this occasion, 149 simple parking spots have been installed in 17 different modules with a plastic composite roof, ideal for marine environments. All the structure is hot galvanized and has a guarantee of 10 years in the coast areas. 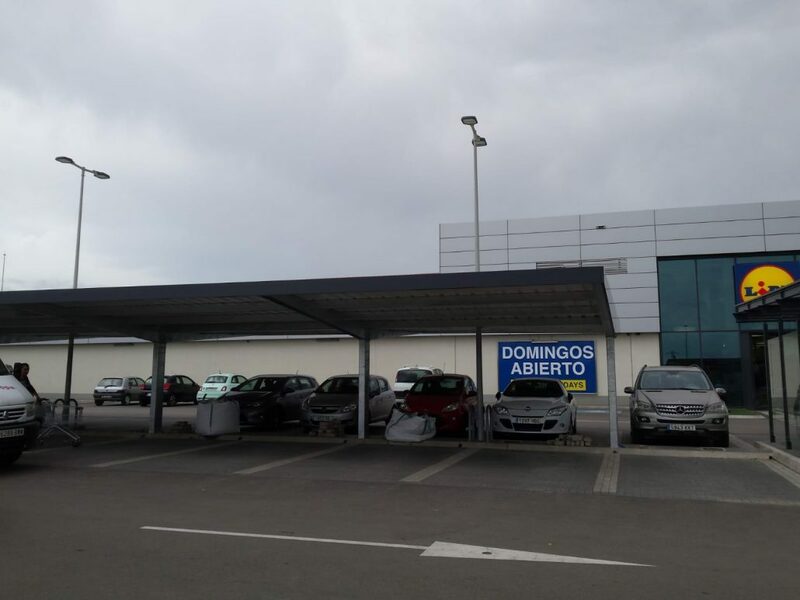 These parking canopies are the best solution for homeowner’s communities and enterprises located close to the coastline in order to protect their cars. We also develop special canopies and metallic covers. 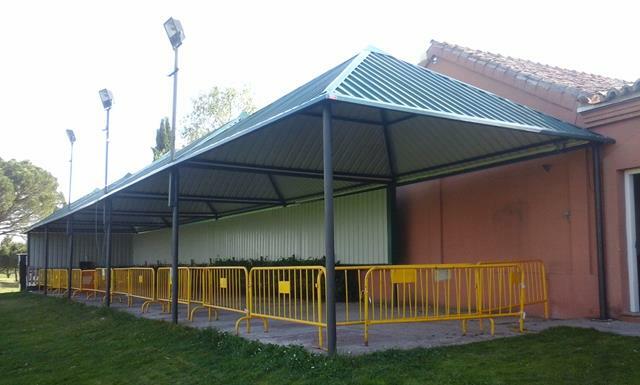 Europa Prefabri carried out the design, fabrication and installation of metallic shelters to cover the football stadium bleachers of Morata de Tajuña, located in the community of Madrid. We installed these shelters to protect the crowd from the weather conditions. Manufacture and assembly of a special metallic structure canopy with a pyramidal shape, custom design for the golf practice area of RACE, at Alcobendas. 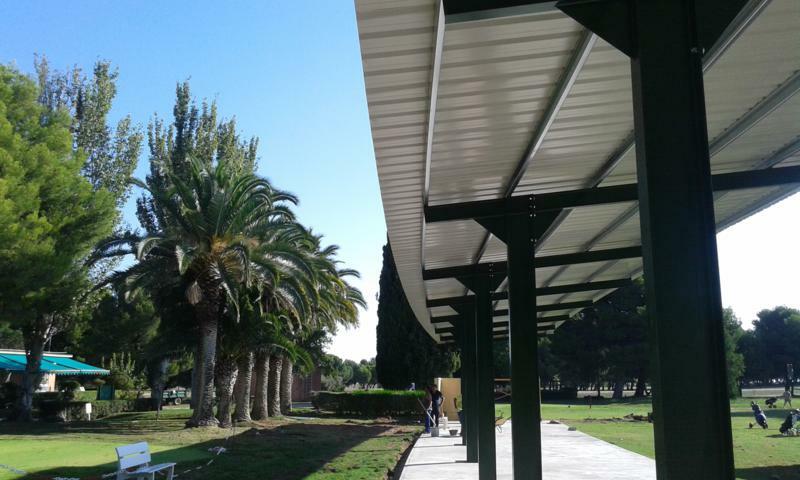 Manufacture and installation of cantilever carports for the golf camp at the Zaragoza Air Base. 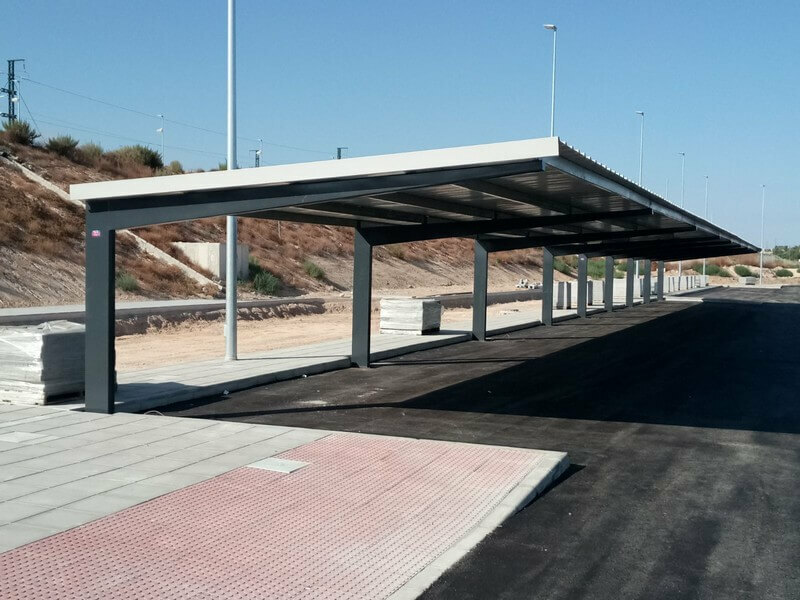 We have carried out the fabrication and installation of a special cantilever carport that will serve as a service station for buses stationed at the South Bus Station, in Méndez Álvaro, in Madrid. We manufactured and assembled the galvanized structure in a short period of time and included auctions and special painting required by the client. All the materials are detachable; they can also be easily assembled. The outcome is an aesthetical and functional parking canopy. 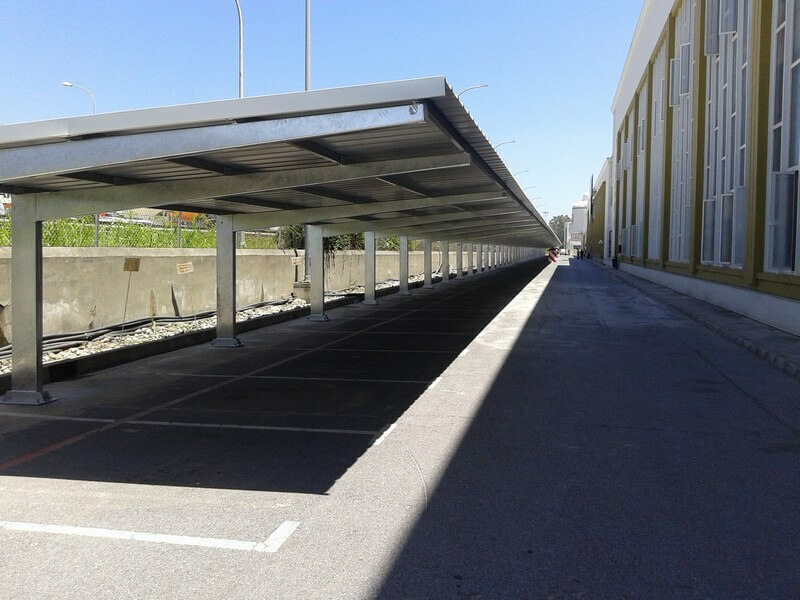 We have manufactured, designed and assembled a new parking canopies project for the AVE station at Elche, Alicante. In this case, a total of 96 parking spaces has been installed, from which 90 spaces are standard, 14 simple and 76 double. Besides, there are 6 spaces with special dimensions for people with reduced mobility. Innovative textile architecture for multiple uses with modern designs: The guarantee a perfect aesthetic harmony with security and materials quality. 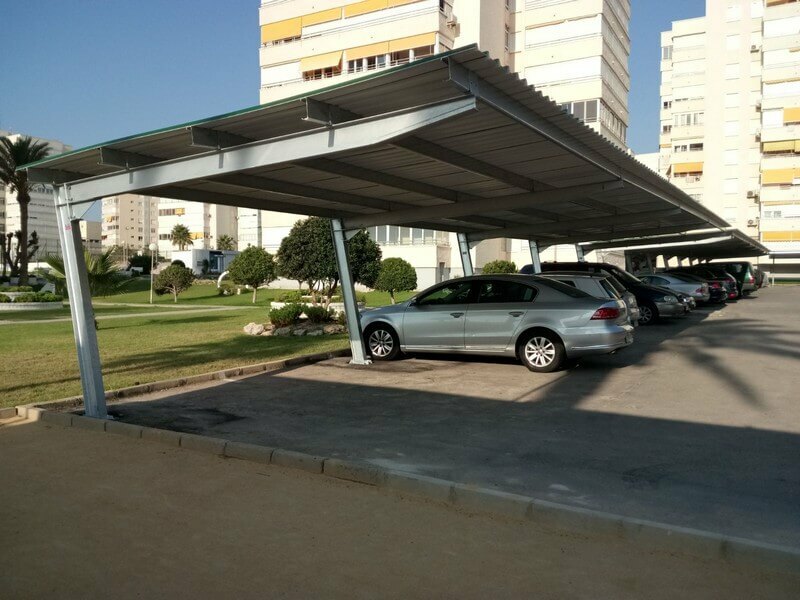 Its versatility goes further the usability as parking canopies for cars, as they can also be used as terraces and gardens for shadow areas. With a box-type girder made with sheets of folded steel. It’s an aesthetic parking canopy, low cost on its most simple or double versions. 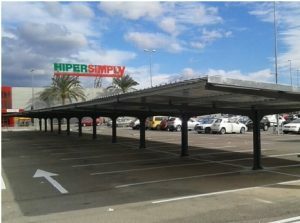 Available solution in all the parking canopy models. Different options for the panel: polyurethane, polystyrene and rockwool. 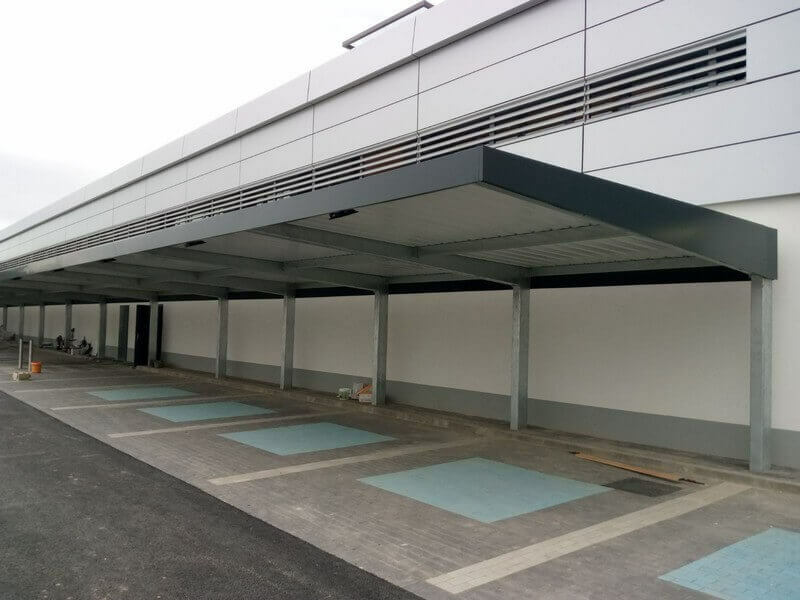 Detachable parking canopy made of hot galvanised steel girders model IPE. Galvanised or pre-lacquered roof in the colour the customer demands. Galvanized or pre-lacquered roof, color upon customer’s request. 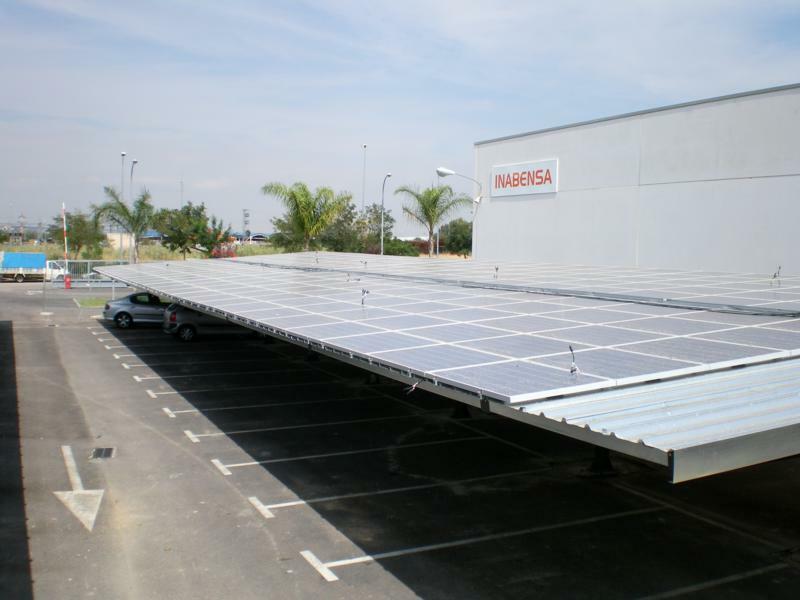 As a company specialized in manufacturing of parking canopies, we have developed several models in order to bear the load of photovoltaic panels on the roof. We manufacture our models as well as the customers’ design. We also develop turnkey solutions that include the supply and assembly of the photovoltaic facilities. We also advice our customers in order to find the energy and structural solution that better adapts to the customer’s project. It is also possible to add charging stations for electric cars (fotolineras). Special design of the metallic parking canopy with a curved shape and folded-steel frames. Galvanized or pre-lacquered roof with color chosen by the customer. Galvanized and pre-lacquered roof, color upon customer’s request. Possibility of a pedestrian hallway with polycarbonate roof in double spaces. Galvanized or pre-lacquered roof, color chosen by the customer. 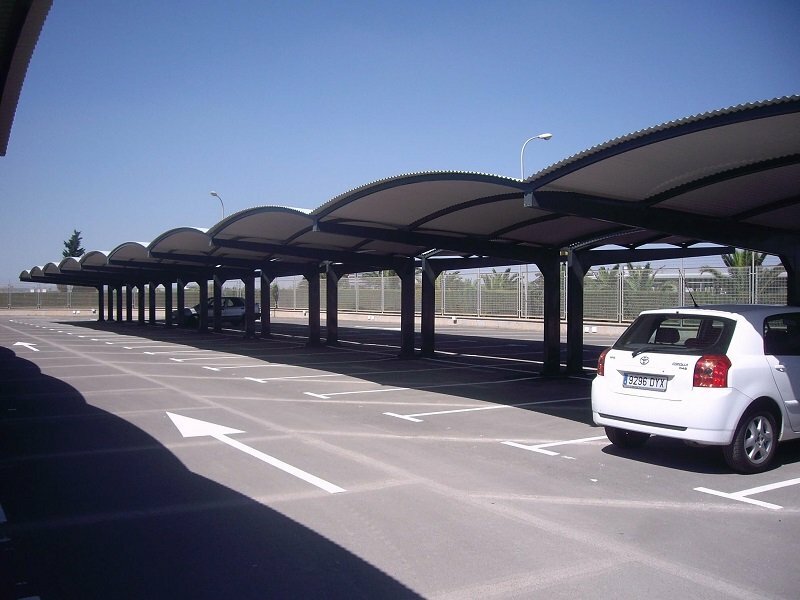 We are specialized in the manufacture and assembly of parking canopies. We have more than 30 years of experience in this sector. 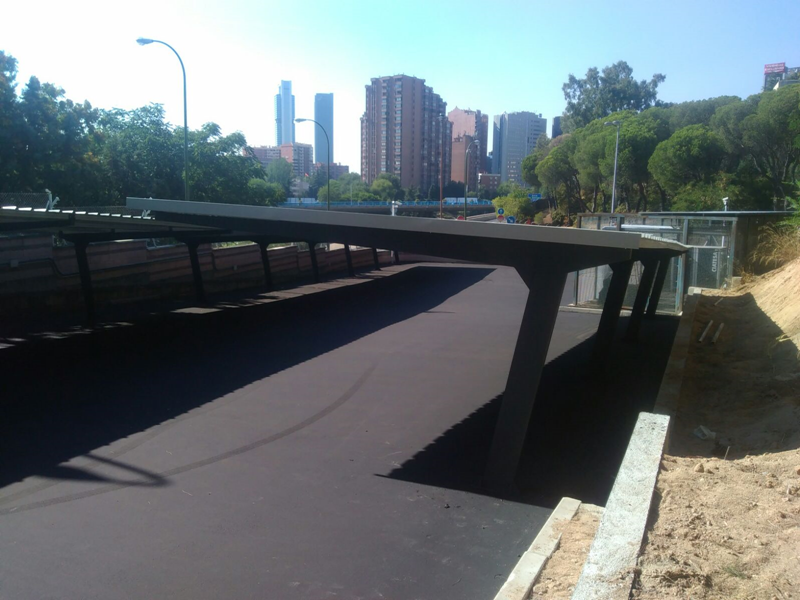 We offer a full service that includes from supply and assembly of guard cabins or automatic barriers to road signaling or civil works: from small private parking canopies to neighborhood parking canopies to big projects in airports, stations, big companies and malls. Estructuras Tubulares Europa is a direct supplier. The materials that we offer as well as the people that work with them, are fully integrated in our company, so there is no intermediation in the compensation established. This basis allows us to provide to our customers the best service with a competitive price. 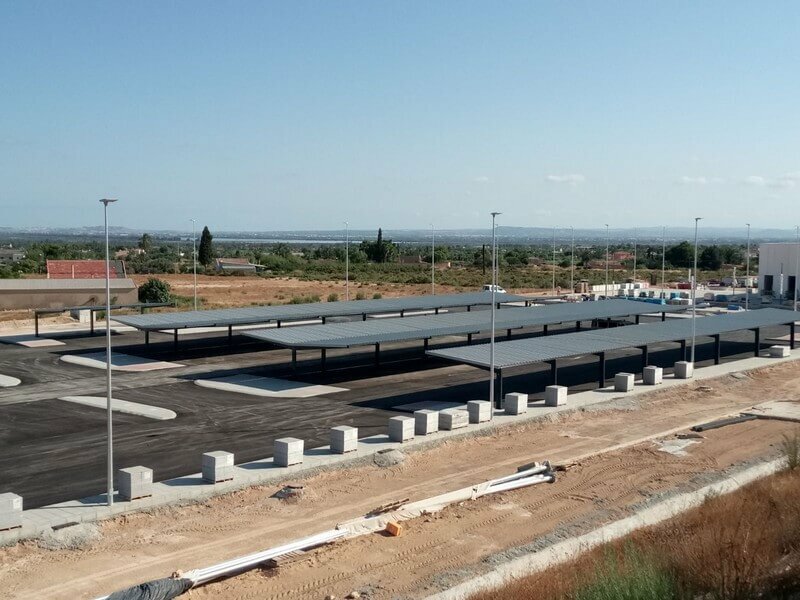 Design, transportation and assembly of parking canopies for Ourgla’s train station parking, in Algeria, where we covered 161 parking spaces in 8 groups for standard cars, 12 parking spaces for special cars for people with reduced mobility and 20 spaces for motorcycles. 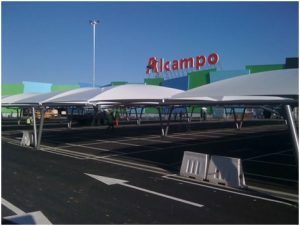 Design, assembly and transportation of parking canopies for AENA, at Málaga’s Airport, with 90 park spaces for cars model “OLA”, with a wave shaped roof. The distribution was of 2 simple modules, the first for 59 spaces and the second for 31 spaces. 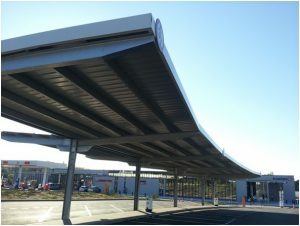 The assembly of 3 special parking canopies to cover the entrance and exit barriers of the parking, as well as another special canopy to cover the ATM. 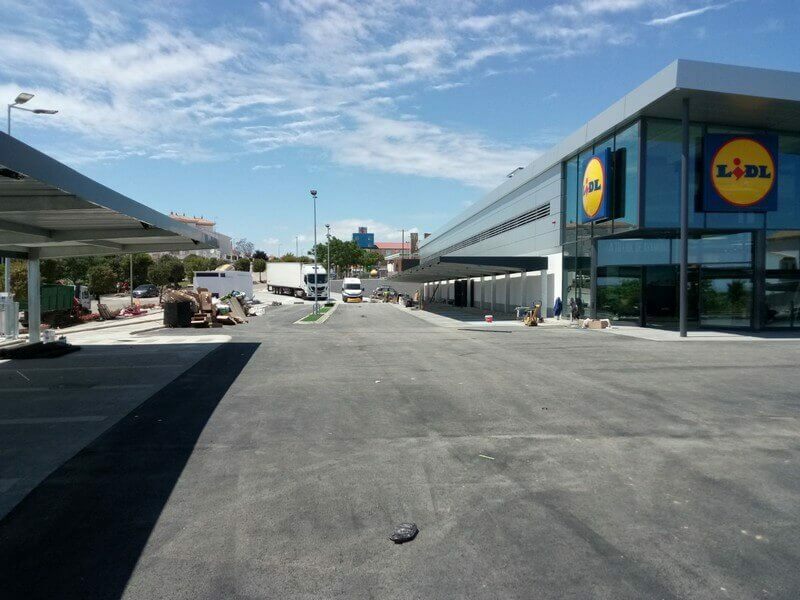 Design, transport and assembly of parking canopies for Mercamadrid’s parking, for Unide Group. 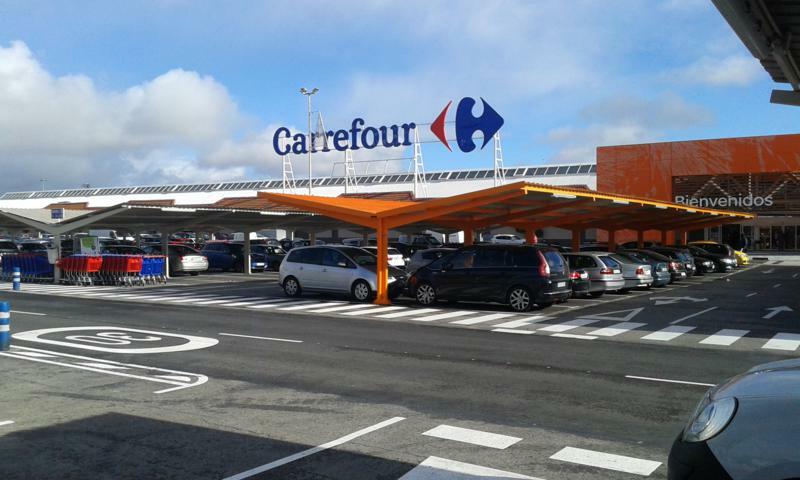 Design, transport and assembly of parking canopies for E. Lecrec supermarkets, at Norbonne, France. 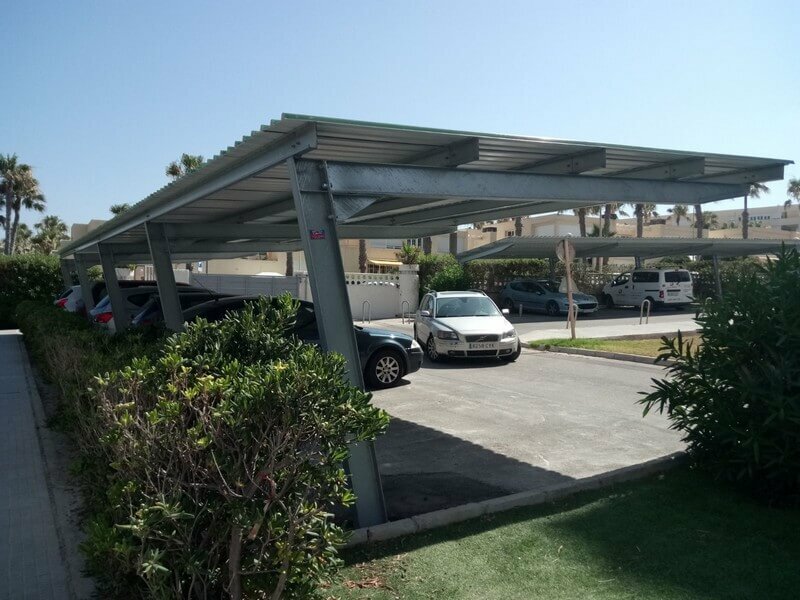 These parking canopies were completely hot galvanized, specially designed with an special height for cars with a roof rack and caravans. 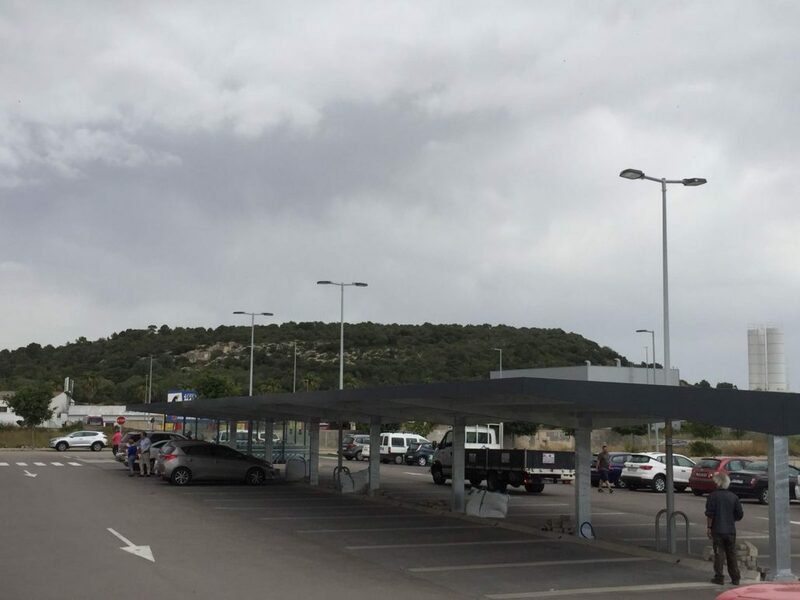 Design, transport and assembly of parking canopies for Madrid Barajas Airport: 1.300 parking spaces, on which previously the dissembling was performed for more than 1.200 spaces and also the cleaning of the area. 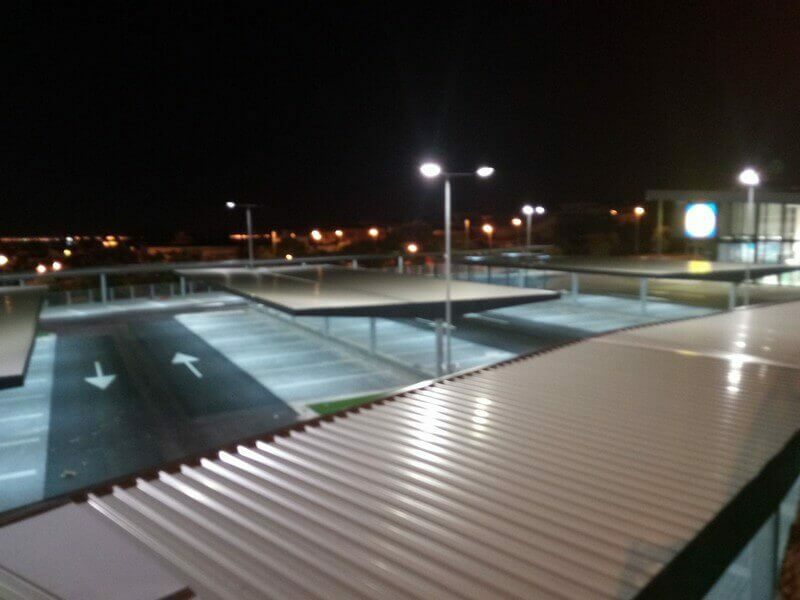 Works developed in 4 phases, where the textile roofs where installed, the parking canopies for a VIP parking, a pedestrian crossing. 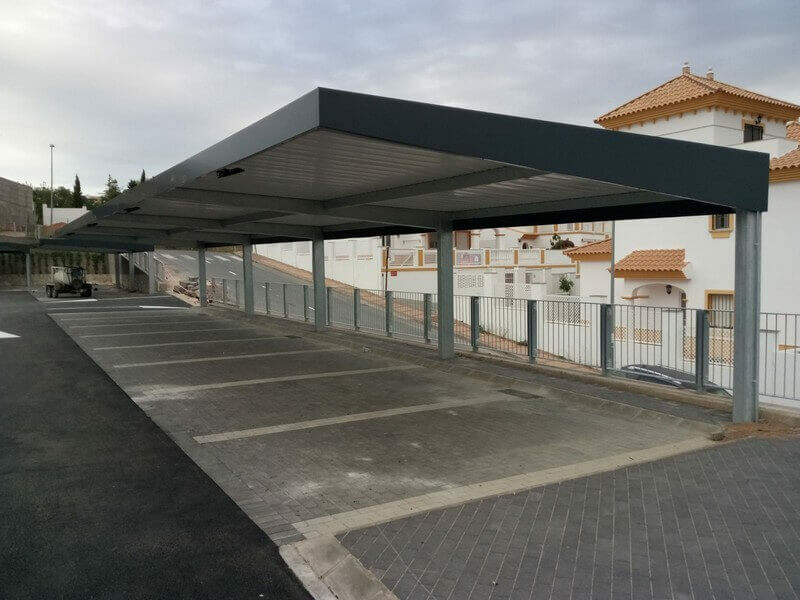 We have manufactured, designed and assembled a project of parking canopies for a homeowner’s community at Alicante. 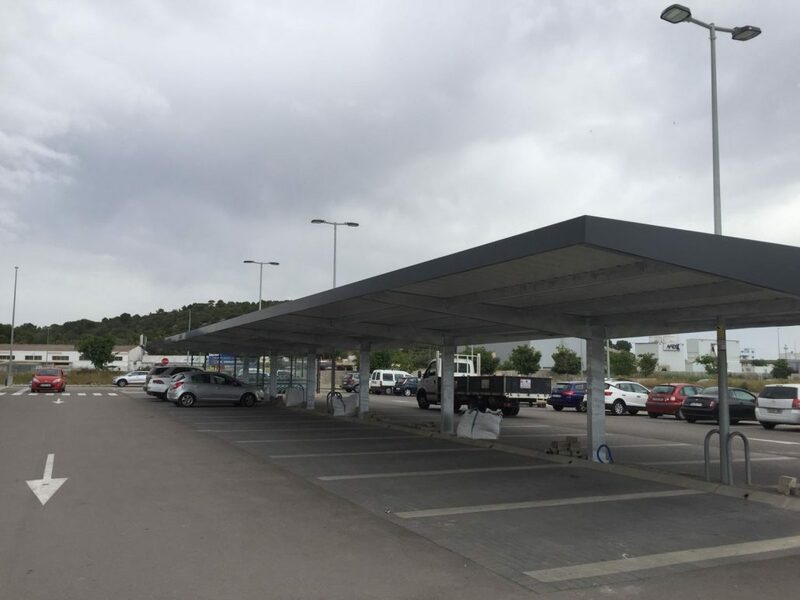 On this occasion, 149 simple parking spots have been installed en 17 different modules with a plastic composite roof, ideal for marine environments. 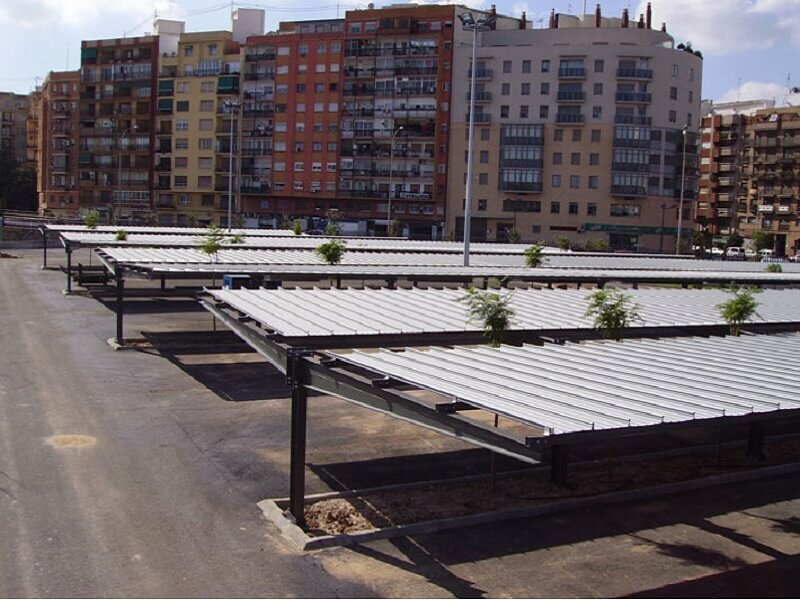 All the structure is hot-galvanized and has a guarantee of 10 years in the coast areas. 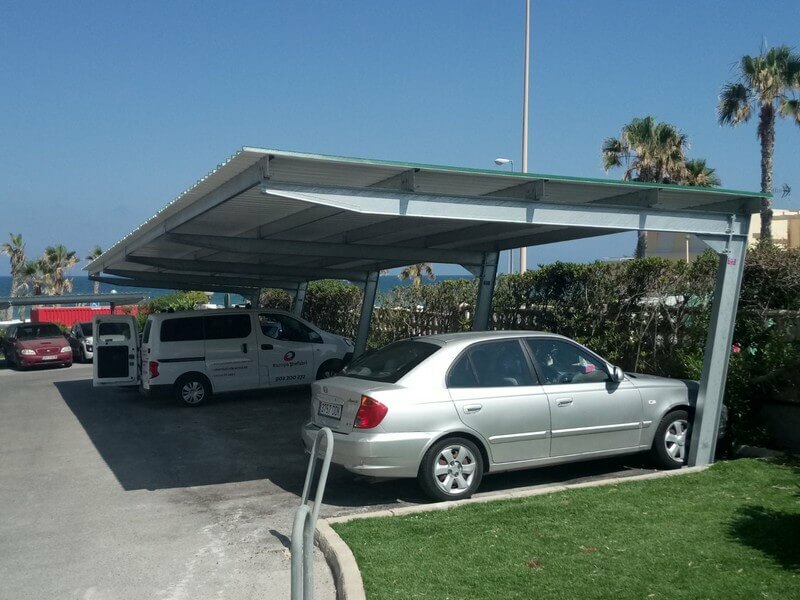 These parking canopies are the best solution for homeowner’s communities and enterprises located close to the coastline in order to protect their cars. 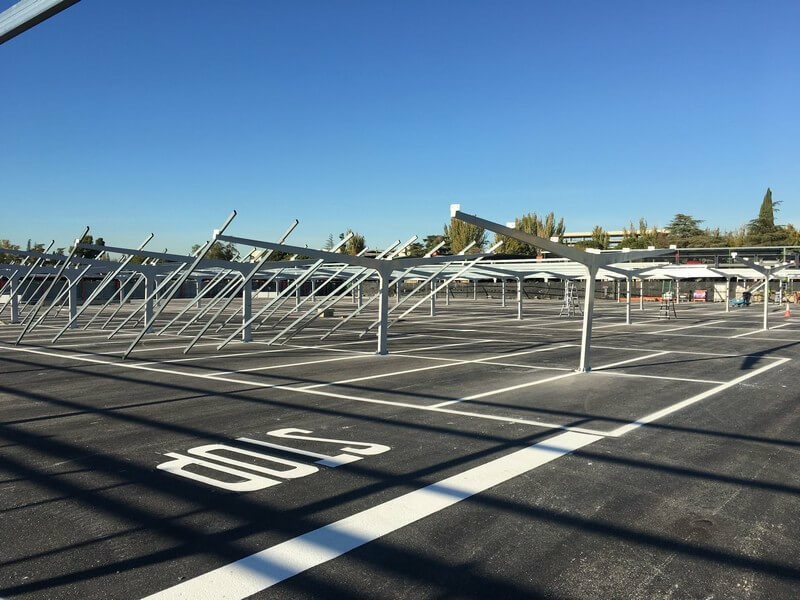 The project consisted of 149 single parking canopies in 17 modules. White composite roof, ideal for coastline areas. Pillar, arm and triangle of IPE, with bolted joint. The installed model has been IPE Garbera type. Height of 2,20 internal meters and 2,90 meters on the higher part. Anchor plates 300 x 250 x 15 mm. 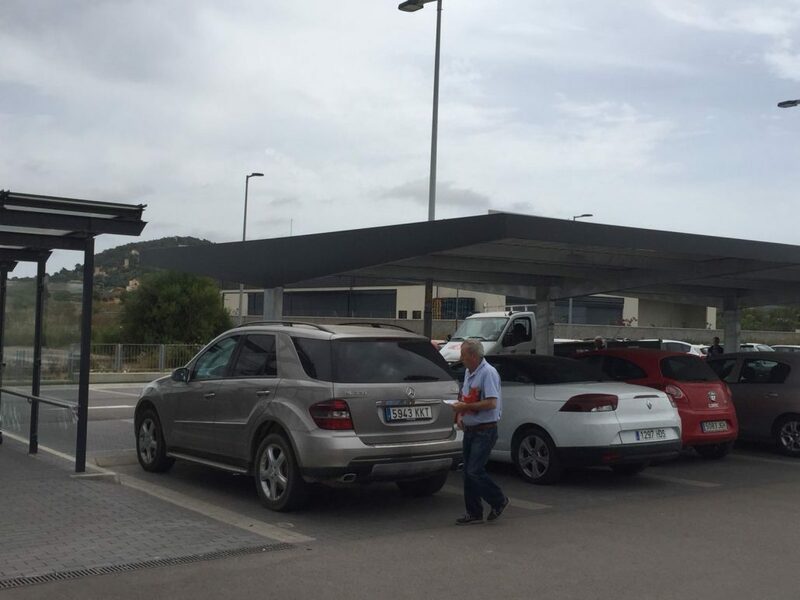 Design, assembly and transportation of parking canopies for AENA, at Málaga’s Airport, with 90 park spaces for cars model “OLA”, with a wave shaped roof. The distribution was of 2 simple modules, the first for 59 spaces and the second for 31 spaces. 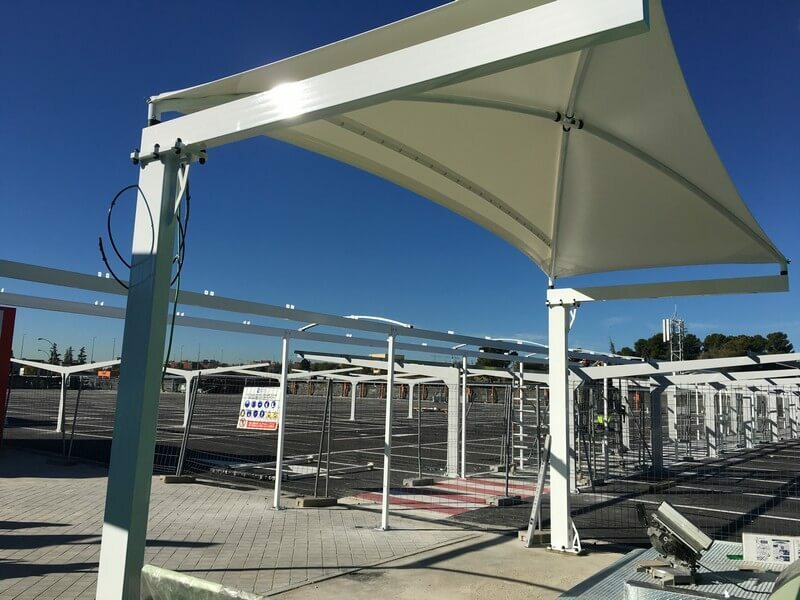 The assembly of 3 special parking shades to cover the entrance and exit barriers of the parking, as well as another special canopy to cover the ATM. 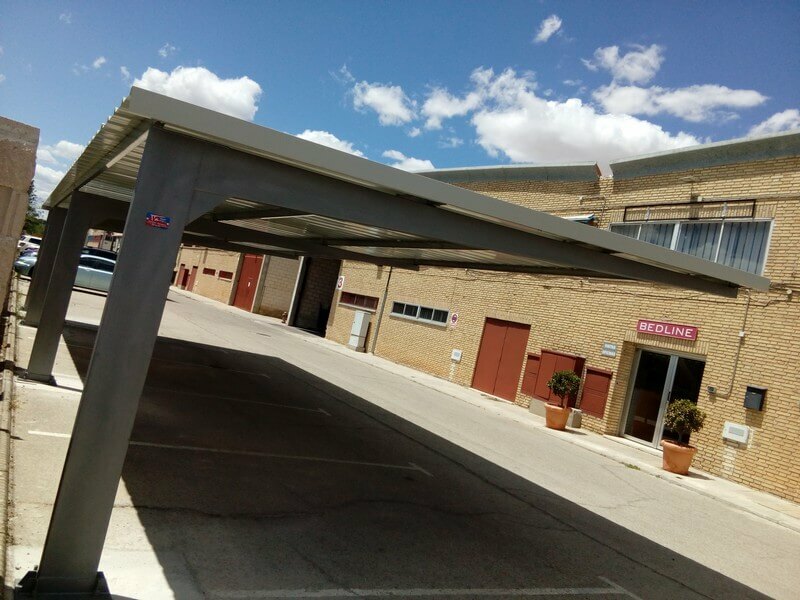 We have made the design, manufacture, transportation and assembly of a new project of parking canopies for Bedline Industrial Ibérica. 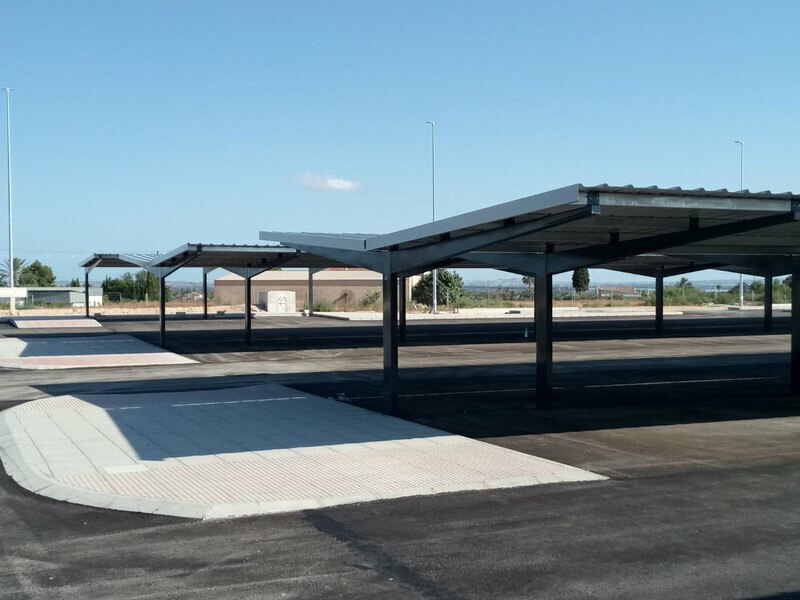 Europa Prefabri Group is specialized in the modular construction and design, manufacture and installation of metallic parking canopies for car parks and other uses. We have more than 30 years of experience in this sector. The project consisted of 5 parking spots in a simple group. Trapezoidal steel roof, galvanized in both sides according to the Sendzimir procedure of 5 meters pre-lacquered in grey. Straps galvanized by electrolysis without paint. First quality sheet column conformed in cold. Simple brackets (column and arm), one slope, painted in gray oxiron color. The installed model has been Europa Type A. 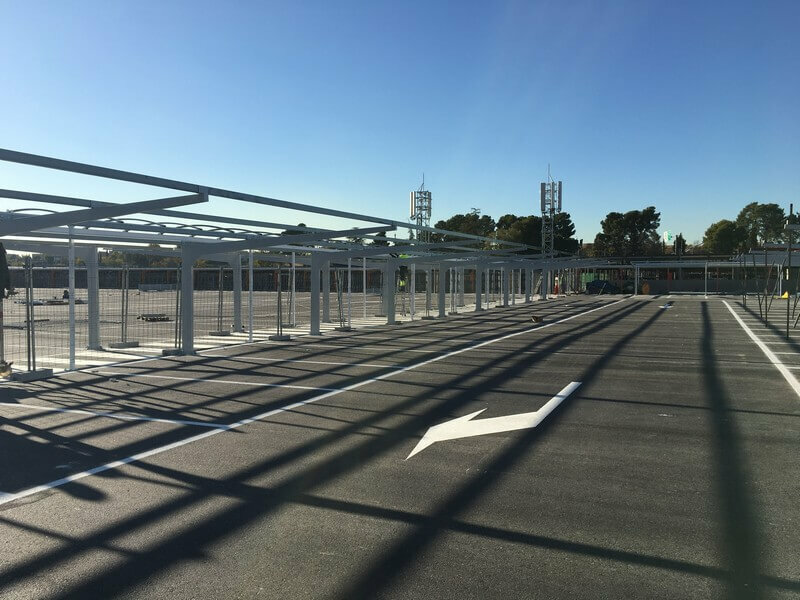 We have developed the manufacturing, design and assembly of a metal parking canopies project for San Miguel’s beer factory at Málaga, which has a surface of 60 000 sqm and produces 2,5 millions of hectoliters per year. Besides, recently it has celebrated its 50th birthday. 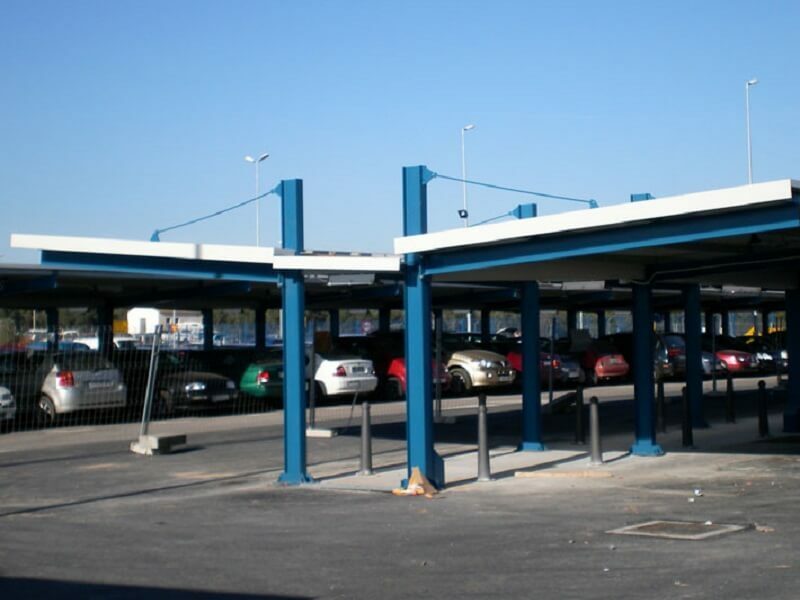 The installed model among our metal parking canopies is the Europa Model type A. Brackets located through the use of chemical dowels. Innovative textile architecture for multiple uses with modern designs. 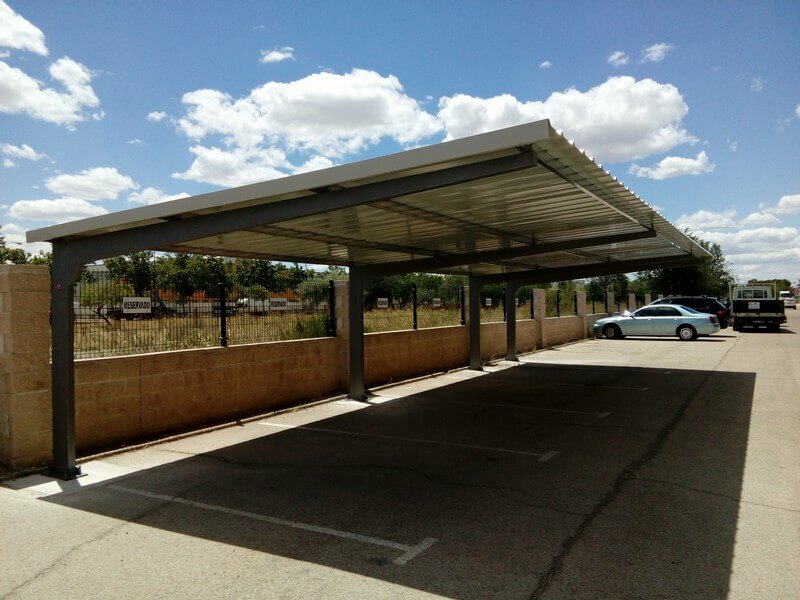 Its versatility goes further the usability as metal parking canopies for cars, as they can also be used as terraces and gardens for shadow areas. 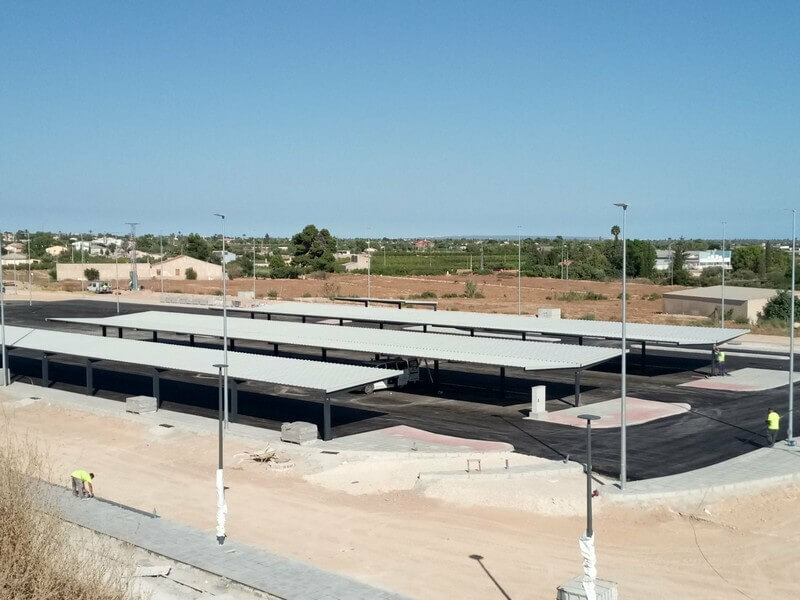 Design, transportation and assembly of parking canopiesfor Ourgla’s train station parking, in Algeria, where we covered 161 parking spaces in 8 groups for standard cars, 12 parking spaces for special cars for people with reduced mobility and 20 spaces for motorcycles. 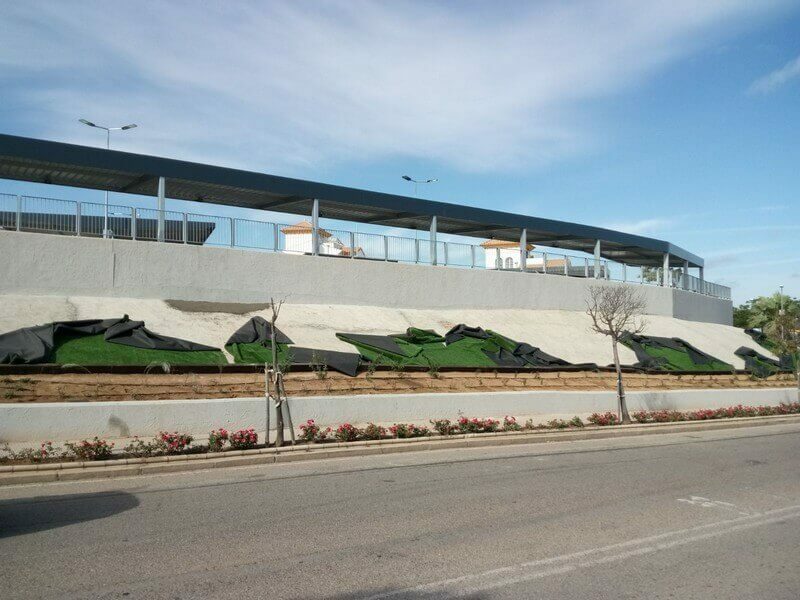 Design, assembly and transportation of parking canopiesfor AENA, at Málaga’s Airport, with 90 park spaces for cars model “OLA”, with a wave shaped roof. The distribution was of 2 simple modules, the first for 59 spaces and the second for 31 spaces. 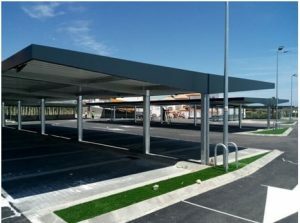 The assembly of 3 special parking canopies to cover the entrance and exit barriers of the parking, as well as another special canopy to cover the ATM. 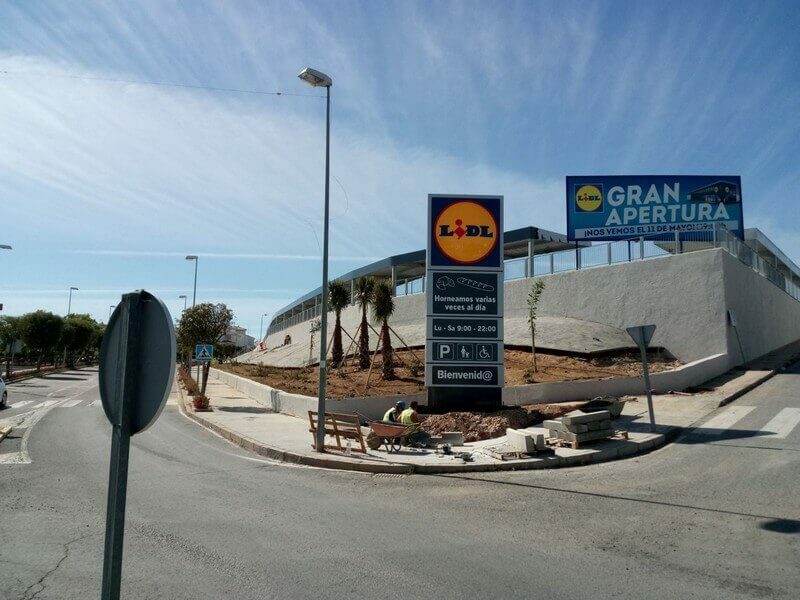 We have realized the manufacturing and assembling of parking canopies with Alucobond for Lidl in Ayamonte, Huelva. 133 places of car park, of which 80 are simple and 53 are double ones. Textile canopies: innovative textile architecture for different uses and with modern designs. They guarantee a perfect aesthetic harmony paying attention to the materials’ quality and safety. The modular structures adapt to the environment’s geometry. Their versatility goes further for the use of parking canopies, as they can also be used as terraces and gardens (shadow areas). Europa Model: with a box-type girder made with sheets of folded steel. Panel cover: we substitute the cover galvanised panel sheet by an isolating sandwich panel to offer a better thermal and acoustic isolation. 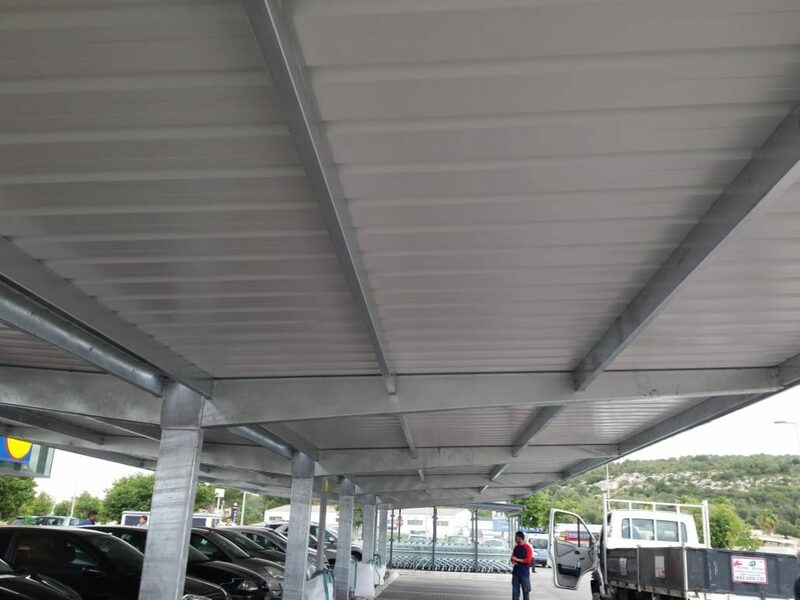 IPE Model: detachable parking canopy made of hot galvanised steel girders model IPE. 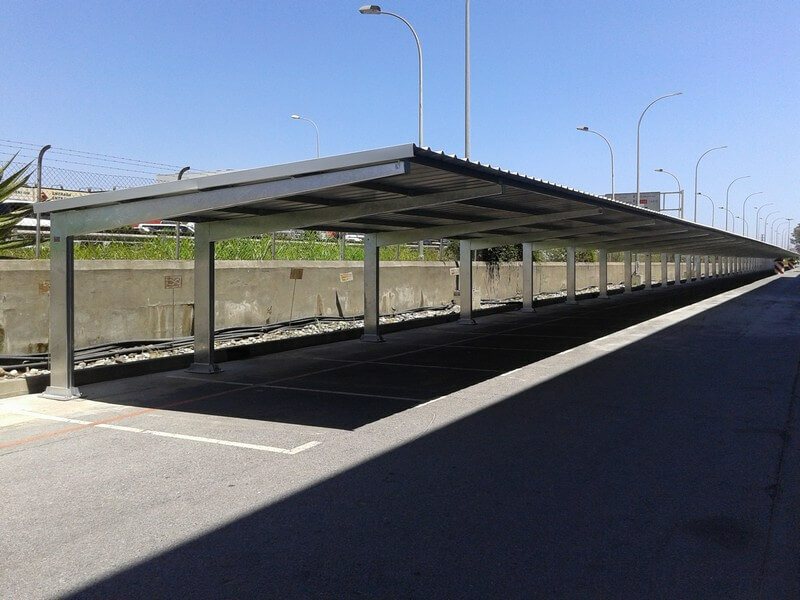 Our last project for Madrid Barajas Airport, were we installed parking canopies for permanent parking access barriers. 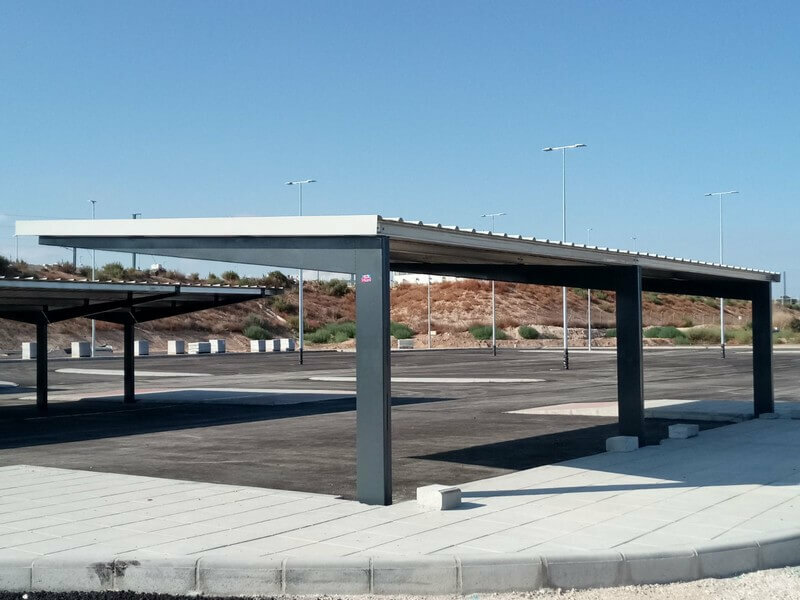 Design, transportation and assembly of parking shades for Ourgla’s train station parking, in Algeria, where we covered 161 parking spaces in 8 groups for standard cars, 12 parking spaces for special cars for people with reduced mobility and 20 spaces for motorcycles. All the materials can be easily disassembled and assembled. The outcome is an aesthetic and functional parking canopy. 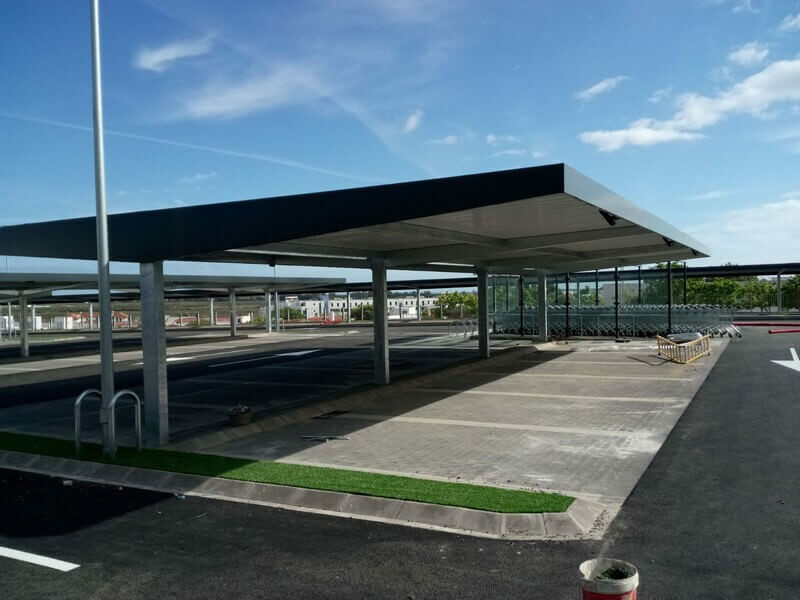 We have performed the design, manufacture and assembly of parking canopies at Avila, A model for 20 simple parking spaces of 5 x 2.5 m at Ávila. 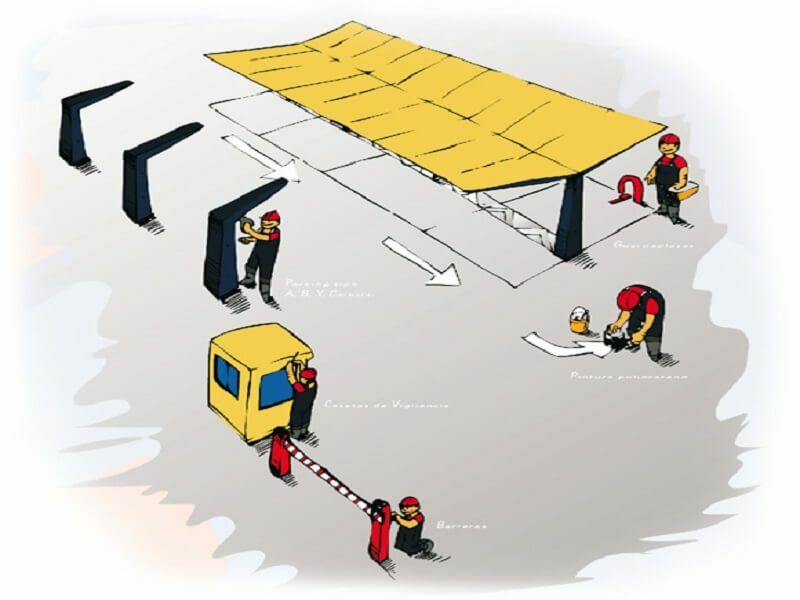 In order to protect cars from climate conditions, we have performed the assembly of parking canopies Europa model, type “A”, that we had previously designed and manufactured. First quality sheet cold formed with a maximum reinforcement pledge in order to obtain a box-beam along the portico. 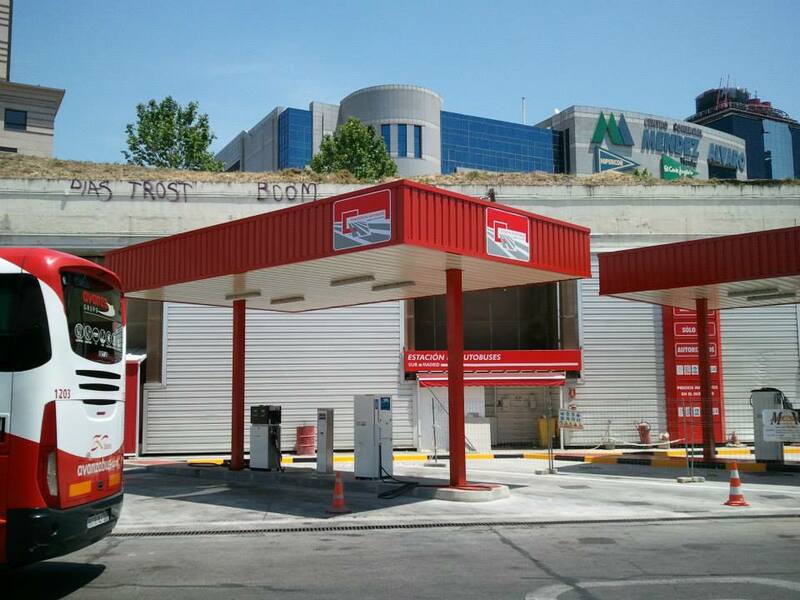 Roof of trapezoidal galvanized steel on both sides sheet according to Sendzimir procedure and pre-lacquered in baztan red, with brackets painted on cream color. Fastening the roof of the portico through galvanized self-tapping screws with neoprene washers that guarantee waterproofing. Tubular galvanized straps by electrolysis without paint. Strap screws and galvanized brackets by electrolysis. Surface: for a 2,5 m width and 5 m long car. 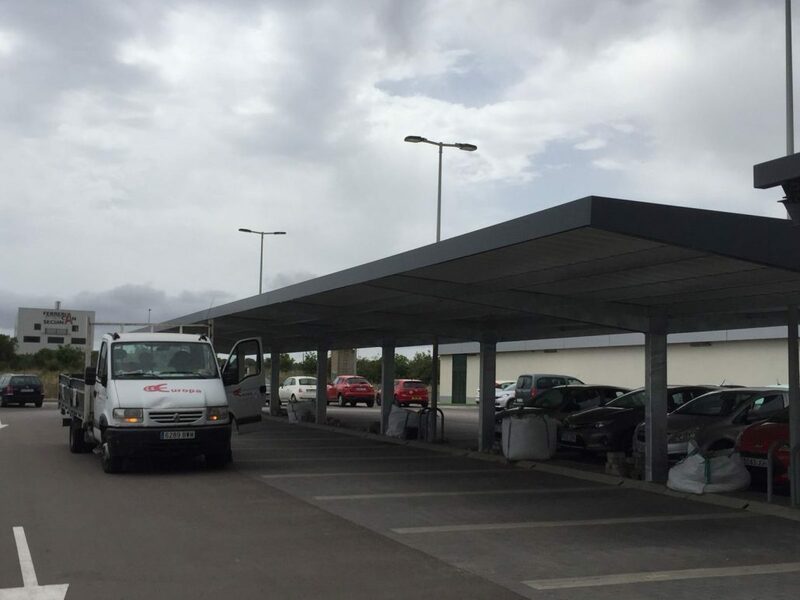 Europa Prefabri Group performs assembly of parking canopies in nationally and internationally. We do all the necessary works for the assembling of the parking in the location demanded by the customer, so he only needs to make an order. 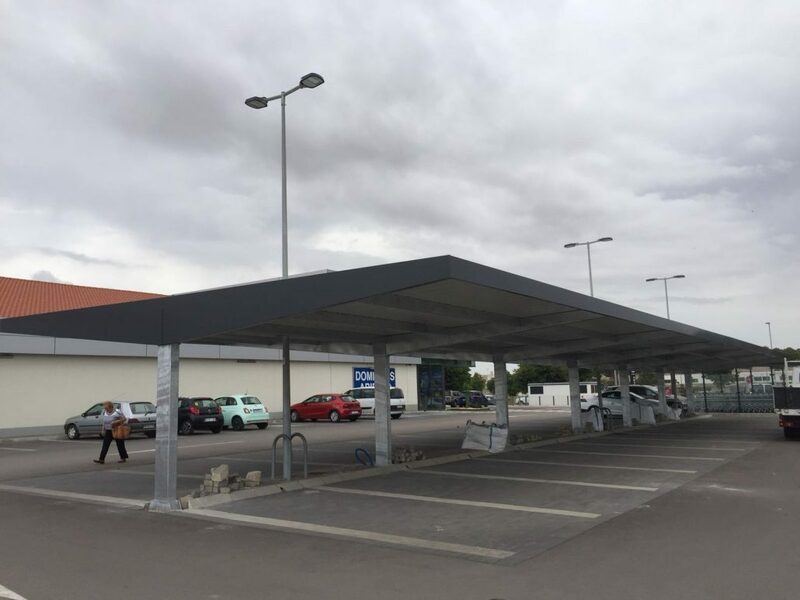 In this case we worked on a project regarding the replacement parking canopies for permanent parking access barriers, including design and assembling. Europa model: it has a box-beam structure, made with galvanized steel profiles. It’s an aesthetic canopy, affordable on its simple or double versions. It has a galvanized or pre-lacquered roof which color can be chosen by the customer. Maximum security and quality material. Panel roof: the galvanized roof sheet can be replaced by isolating sandwich panel in order to offer a better thermal and acoustic isolation. 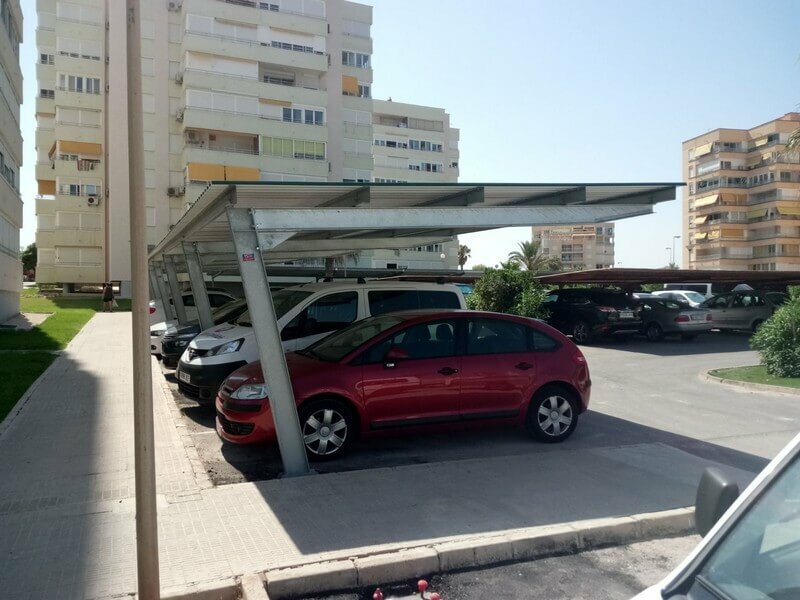 This solution is available in all the parking canopy models. Different panel options: polyurethane, polystyrene and Rockwool. Maximum solidity in order to resist wind and snow overloads. Different versions depending on the type of beams used. 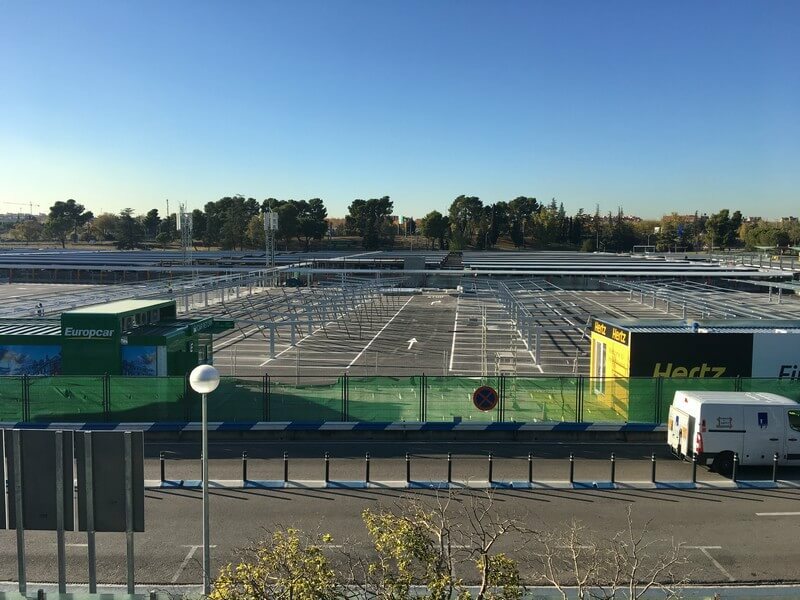 We have replaced parking canopies for permanent parking access barriers at Adolfo Suárez-Barajas Airport in Madrid. 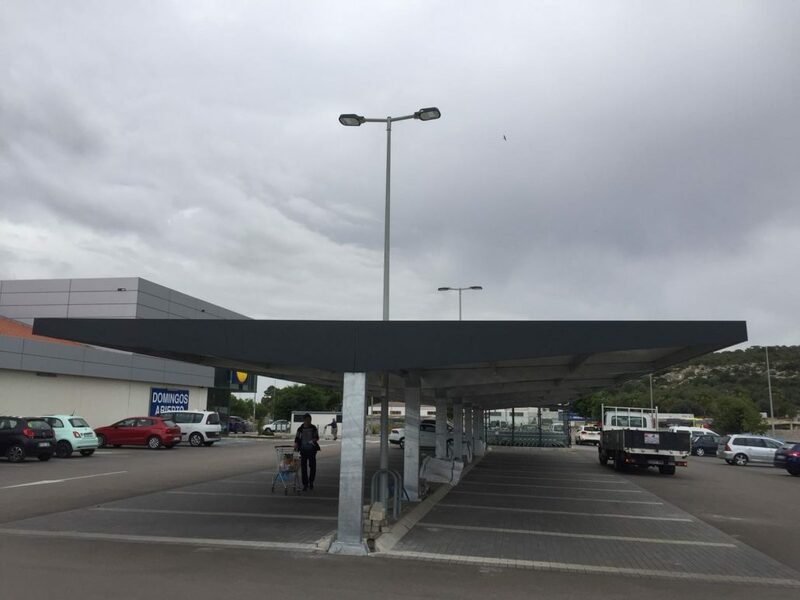 These parking canopies were designed and manufactured following the technical specifications required by the customer, so the canopies could have the same characteristics as the previous ones. We have also developed the transportation and assembling. 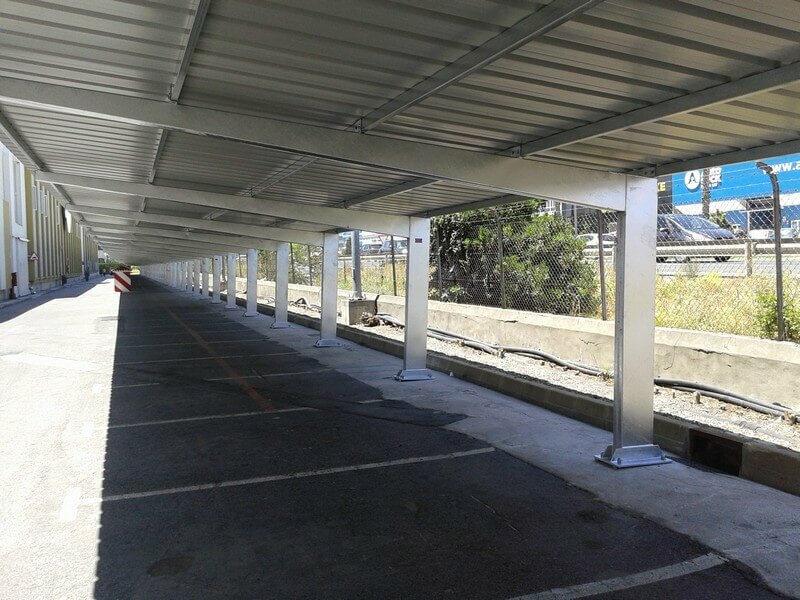 Parking canopy 8,20x6m, sheet pillars of 380x100x3mm. Galvanized straps without paint, C-125x3mm. Roof made of a pre-lacquered trapezoidal sheet 4,10m long. Blue color on the exterior side of the roof (grey internal side), sheet gutters and finishing in White color, PVC drainpipes. 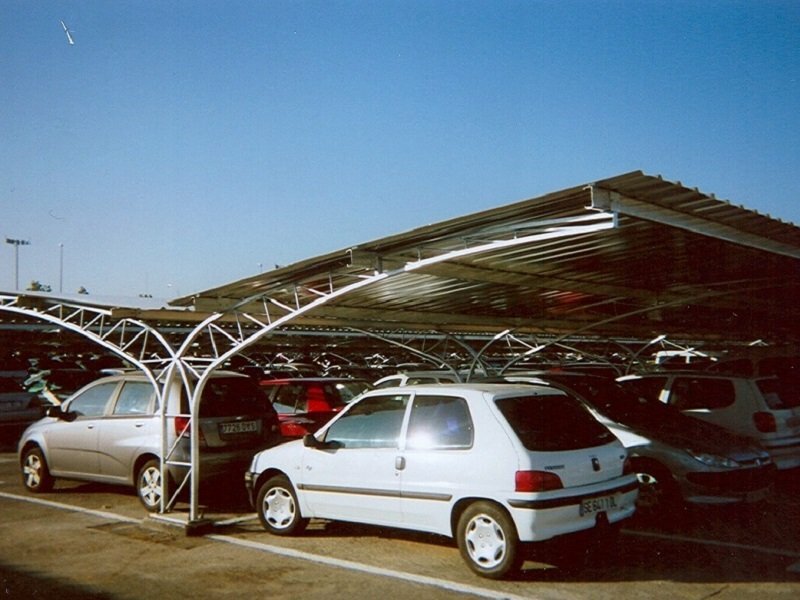 We are specialized in the manufacturing and assembling of metallic parking canopies. We have more than 30 years of experience in this sector. 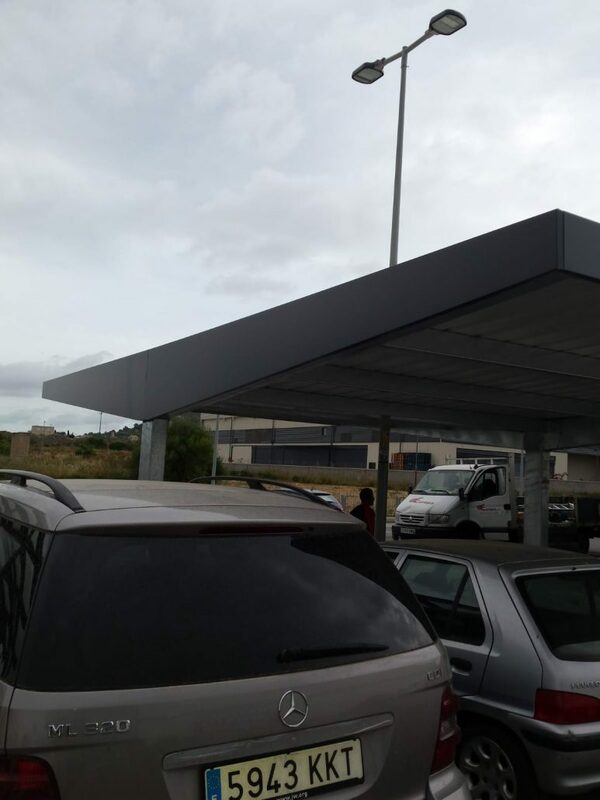 We have finished the manufacture and assembly of custom parking canopies for a pólice station for Navarra’s Police Force, at Pamplona. This institution was founded by the Provincial Council of Navarra in 1928, originally with the name of Cuerpo de Policía de Carreteras, where their functions were mainly related to traffic. Its creation was fomented by the changes in transportation means and the improvement of the road network. During this time, the motor vehicles weren’t that spread and utility vehicles could reach 65km/h. The most popular transportation means were draft animals and train. Two years before, the Royal Decree for the National Road Network had allowed renewing the road network, eliminating dangerous turns and cambering the external borders to counter centrifugal force. This was a huge technical step, which had only been used for race circuits. Traffic management and transportation, collaborating with the Spanish Civil. Secure the compliance of all the jurisdictional dispositions from the provincial council. Administration and cooperation with local authorities and other security forces. Help population in danger or emergency situations. With the arrival of democracy, their functions kept on growing, counting on a staff of more than 1.000 people. If you want to know more about the history of Navarra’s Police Force, you can click here. 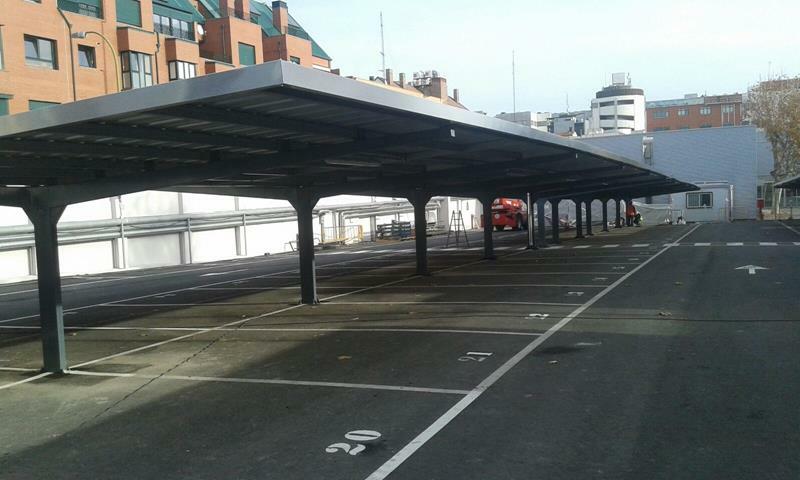 To protect cars from climate conditions we have assembled custom parking canopies model Europa type Y in only 3 days. Previously, we had manufactured them in our facilities. Park space measures: 2,5 x 5 m.
Europa Prefabri Group carries out the assembly nationally as well as internationally. 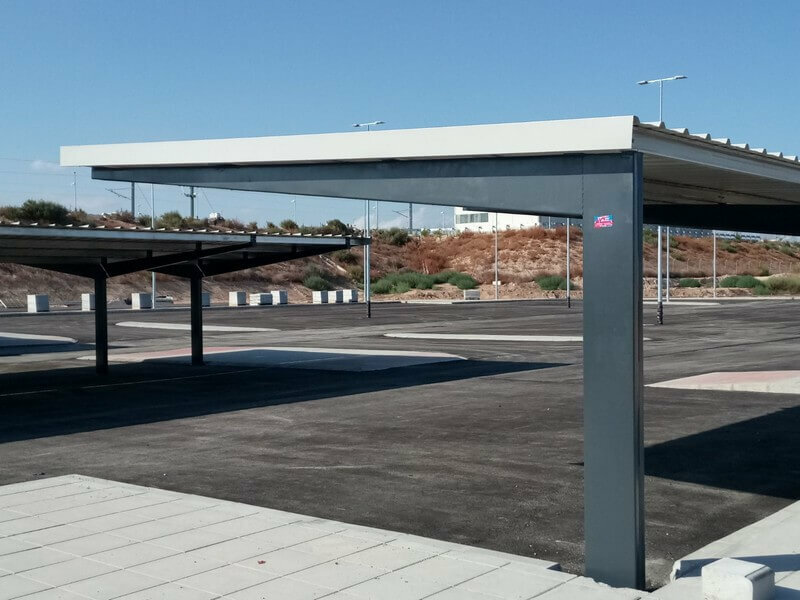 Design, transportation and assembly of custom parking canopies for Ourgla’s train station parking, in Algeria, where we covered 161 parking spaces in 8 groups for standard cars, 12 parking spaces for special cars for people with reduced mobility and 20 spaces for motorcycles. 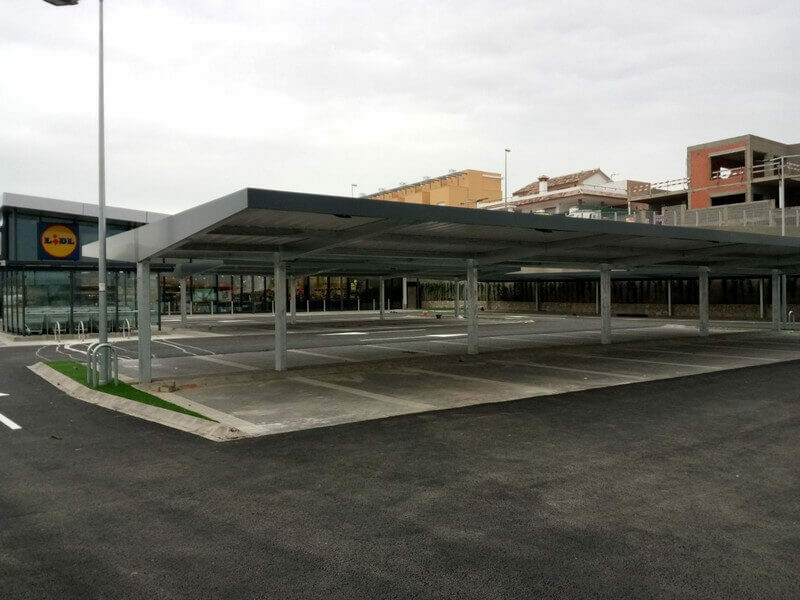 Design, transport and assembly of custom parking canopies for Mercamadrid’s parking, for Unide Group. All materials can be dissembled and assembled easily at the construction works. 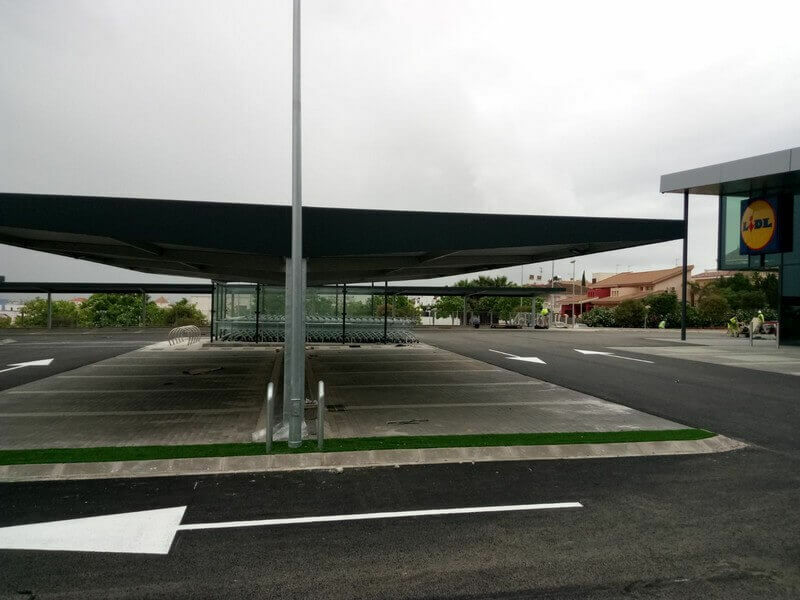 The result is a clean, aesthetic and functional parking canopy. Model Europa: with a metal box beam structure, performed with steel bended profiles. 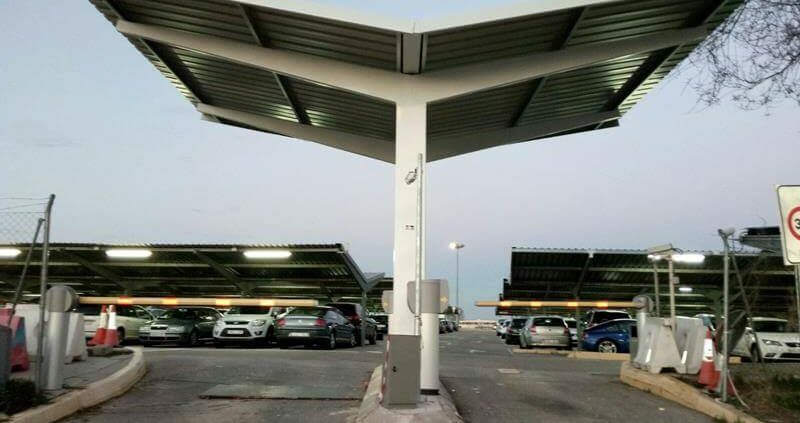 This is an aesthetic parking canopy, that can be cheaper with more simple versions. Galvanized or pre-lacquered roof in the color the customer wants. Maximum safety and material quality. 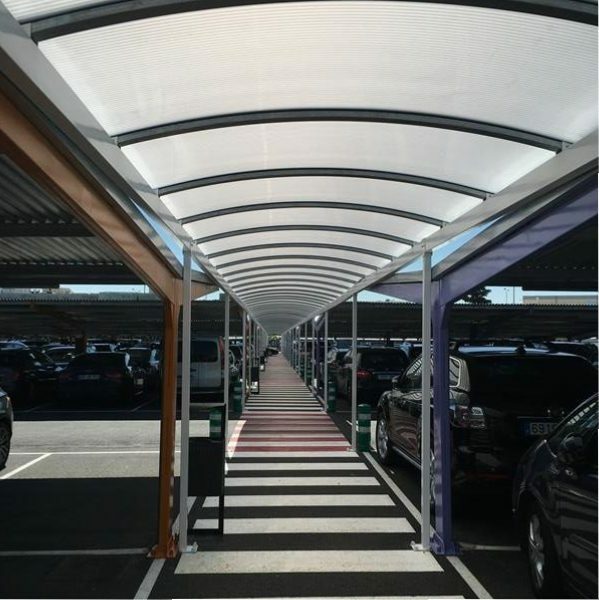 Textile parking canopies: innovative architecture for multiple applications with modern designs. We guarantee a perfect aesthetic harmony without forgetting safety and material quality. Modular structures can be adapted to the place geometrics. 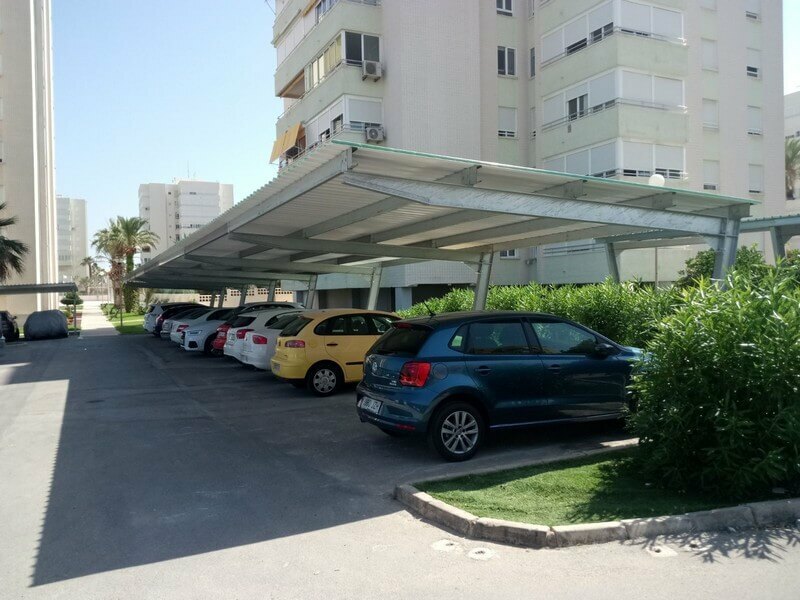 Its versatility goes further than their use as parking canopies, as they can also be used in terraces and gardens for shadow spots. Panel roof: we can replace the galvanized sheet roof for an isolated sandwich panel to offer a better thermal and acoustic isolation. Available solution in any type for parking canopy models. Different panel options: polyurethane, polyethylene and Rockwool. 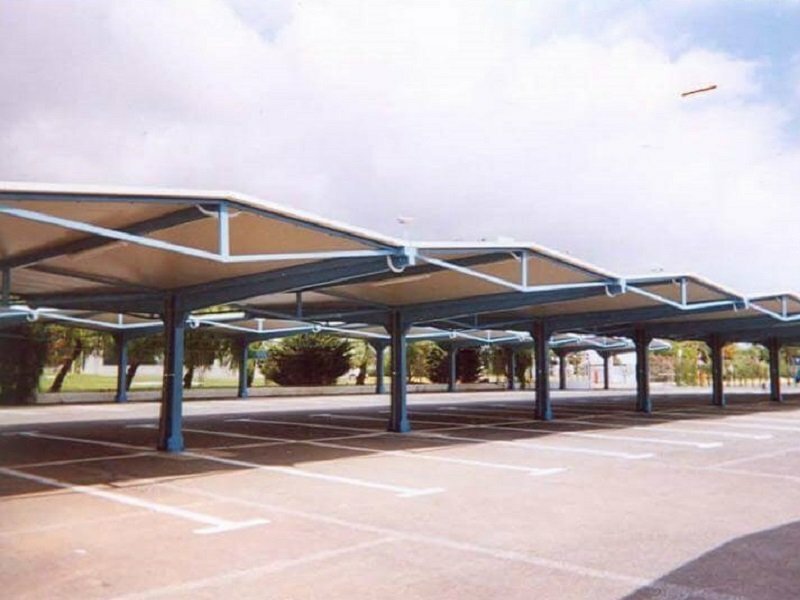 IPE Model: detachable parking canopies made with hot laminated steel trusses type IPE. Great robustness of the structure to bear overloads of wind and snow. Different versions depending on the type of trusses used. Galvanized or pre-lacquered roof in different colors. Hot galvanized structures under request.